Austin Industries is celebrating 100 years in business - a full century of providing world-class service for our customers. 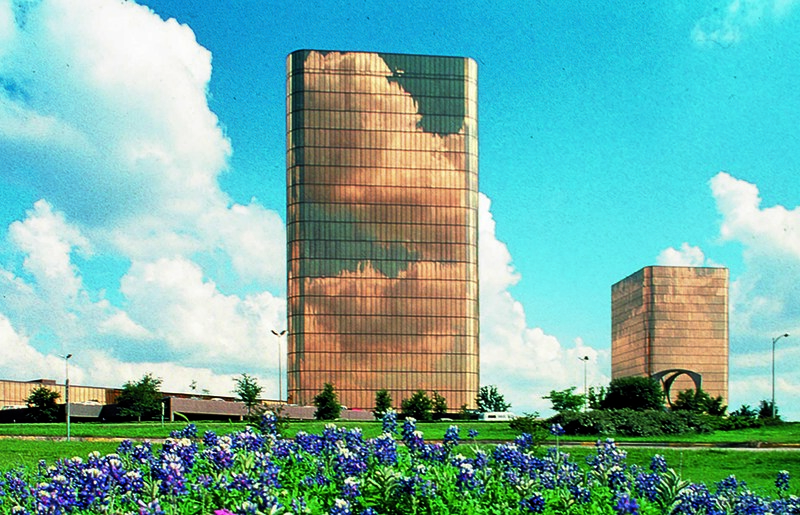 Austin has been a value-driven company from the beginning. 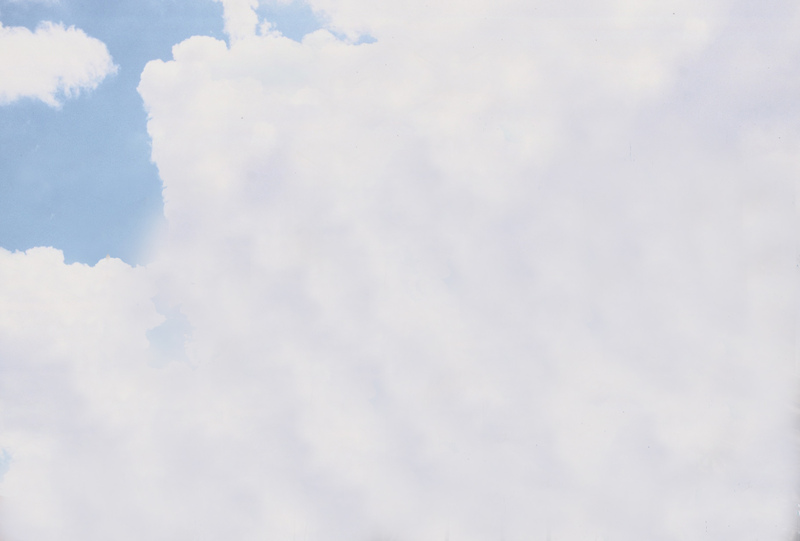 Our organization has always focused on our employee-owners and operational excellence. We like to say our “People and Performance” make the difference! 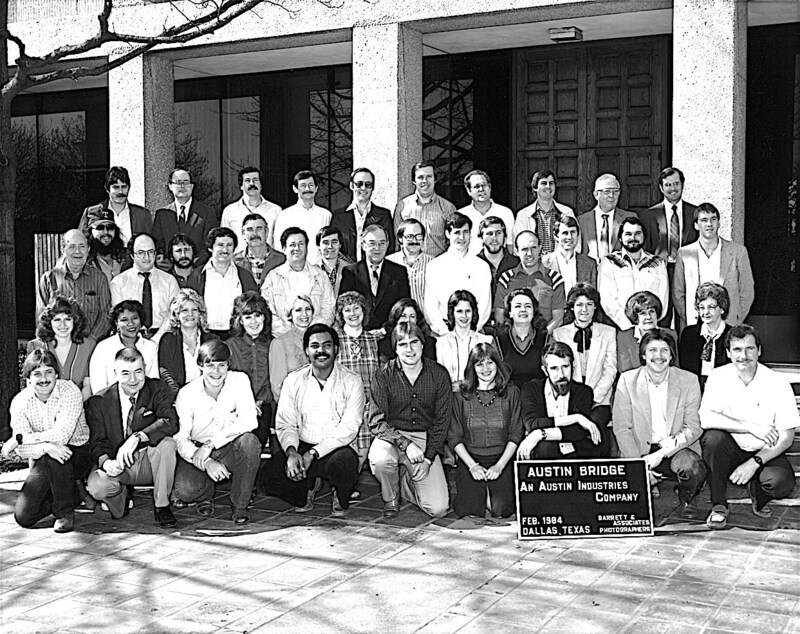 Austin has always been guided by visionary leaders who had the foresight to anticipate great changes and meet each change head on with a new service or innovation. 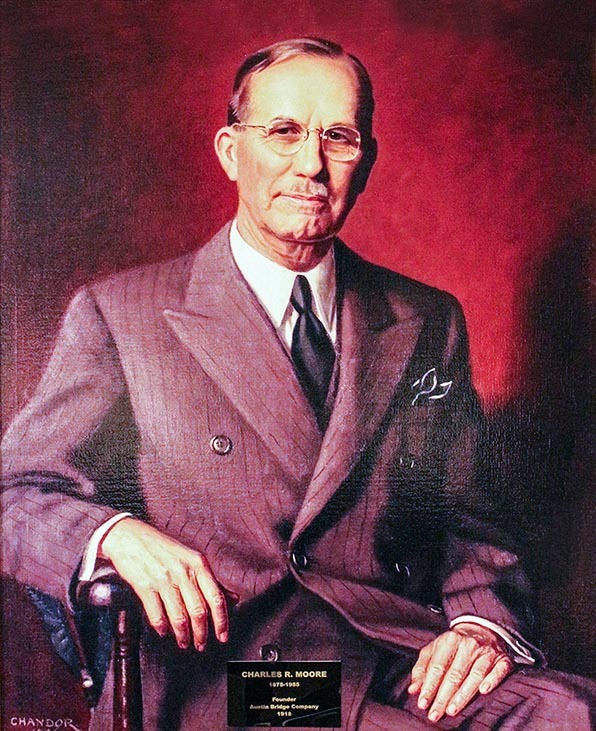 Founder Charles Moore did it with the transition from horses to cars and started building bridges and roads way back in the early 20th century. 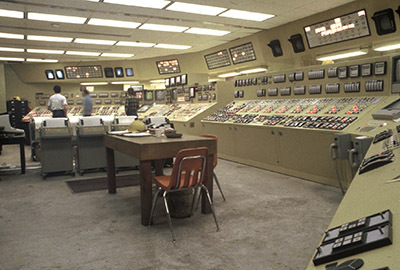 Through the years, Austin has built bridges, highways, road equipment, farm implements, wastewater treatment plants, power plants, hospitals, airports, sports stadiums, universities, and even almost 30 million magnesium bomb bodies to support Americans in World War II. 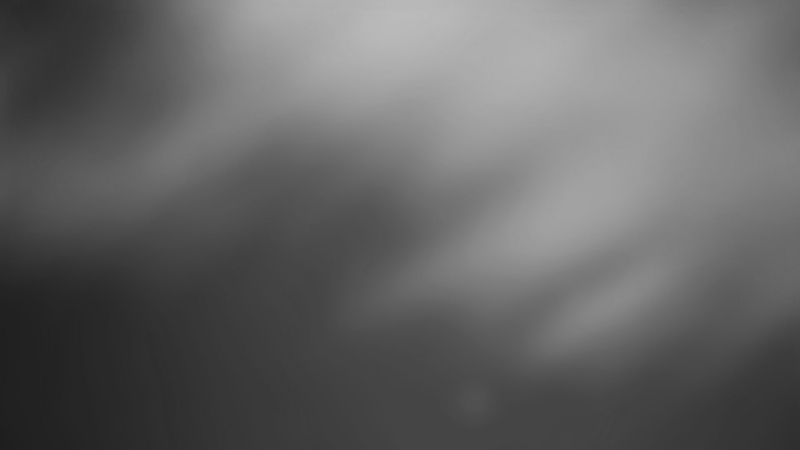 We are constantly changing the company to stay relevant and meet needs as they arise. 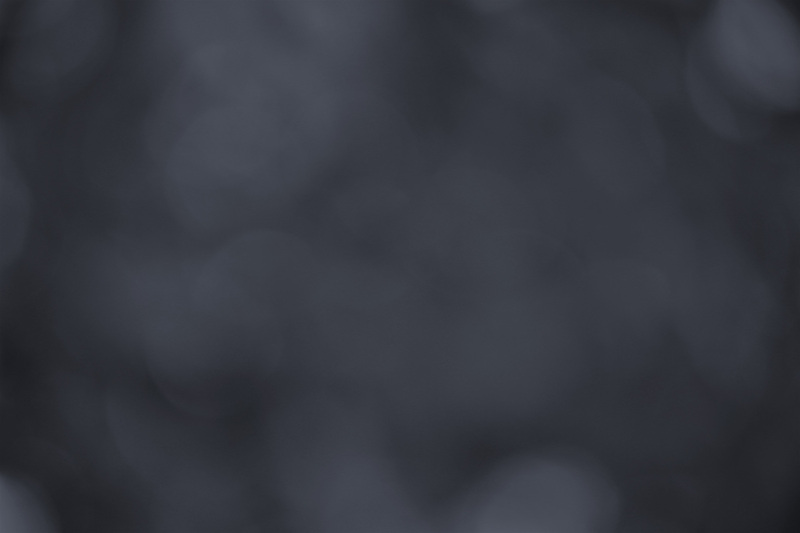 Employee-owners have lived our core values of safety, service, integrity, and employee ownership over the years so that when others hear the Austin name, it means something extraordinary. 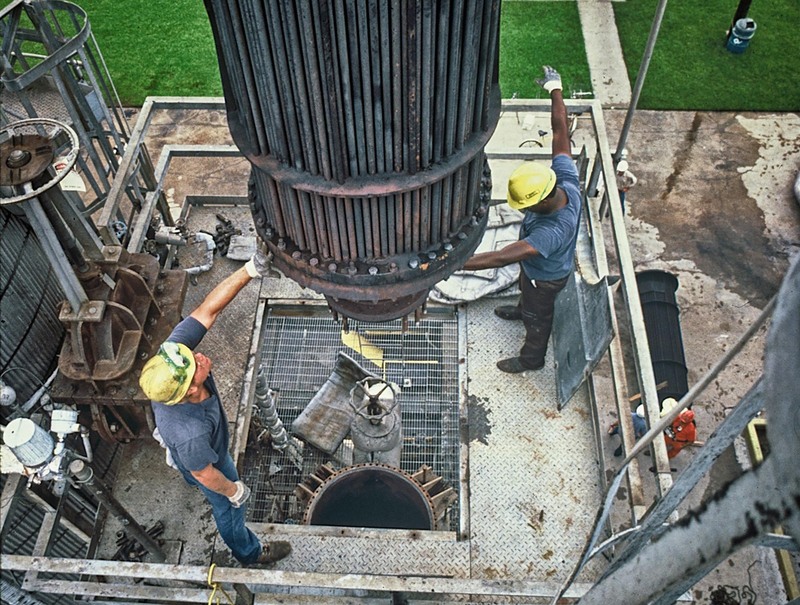 Austin has built a reputation for world-class safety performance and operational excellence in each Austin company. Likewise, our service and our integrity are tied to our culture of employee ownership. When people ask the secret to our success, we always point to our culture and our people. That’s not something that happens overnight! As we look toward the next century of Austin Industries, we must realize that the quality of the people we train ultimately determines Austin’s long-term success. That’s why we keep our people highly motivated and grow the next generation because you are only as good as the people that you have in your business today. We invest large amounts of time in the business of grooming Austin leaders and emphasize training employee-owners to think as an owner thinks. All employee-owners share the responsibility for the results and focus on moving Austin in the same direction. That’s who we are on our 100-year anniversary, and it’s the same approach that will take us through the next century. Foundational to our company’s culture is the way we share profits with our employee-owners in our business, from top to bottom. 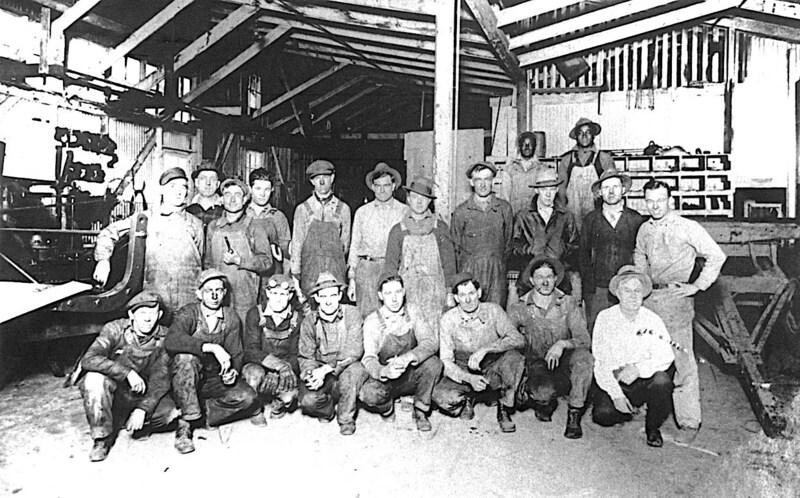 The Moore and Solomon families were always very generous and shared the company profits with the employees. 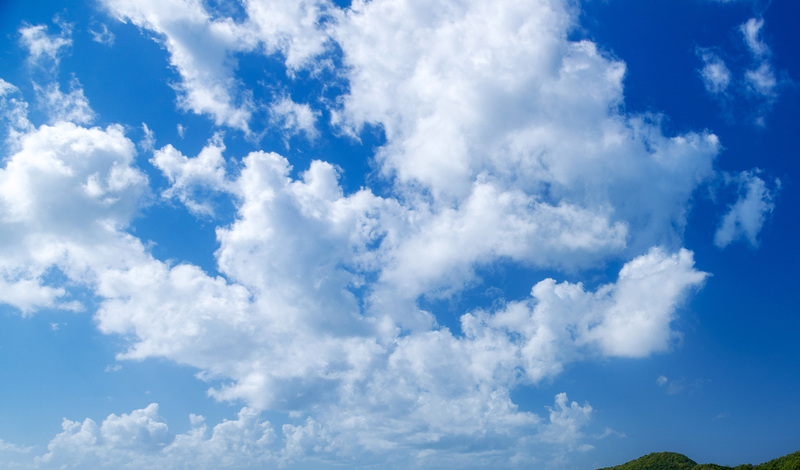 This culture of sharing evolved into 100 percent employee ownership today. 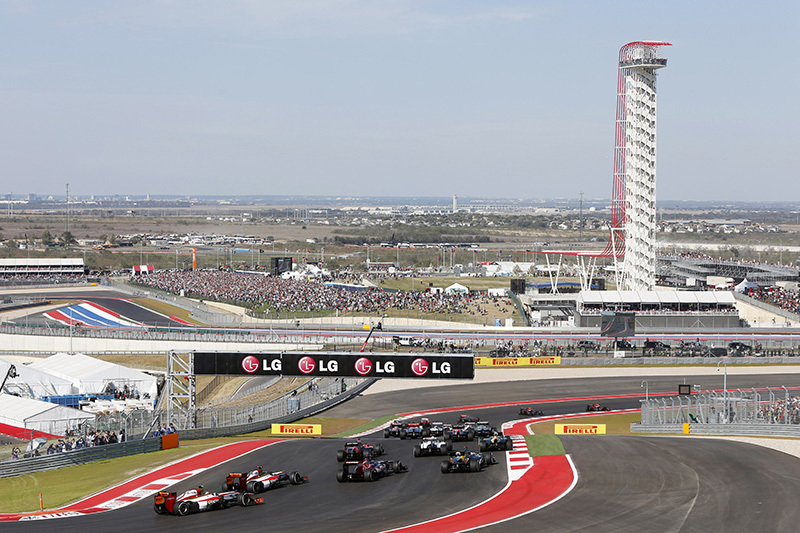 We own it at Austin! 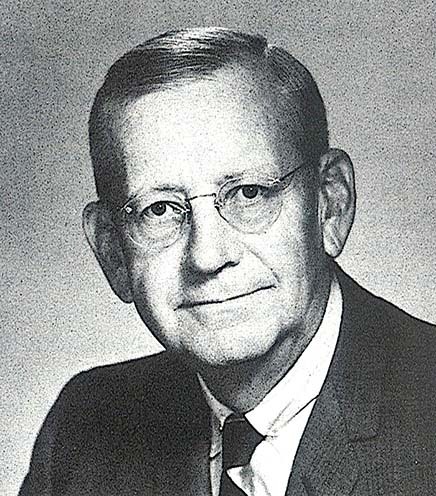 The Austin name becomes known in Dallas when George Austin begins working in Texas’ bridge building industry as an agent for the George E. King Bridge Co. of Des Moines, Iowa. Five years later, his brother Frank joins the firm. Austin Brothers, southern agents to the George E. King Bridge Co., hires Charles Moore as an office stenographer. 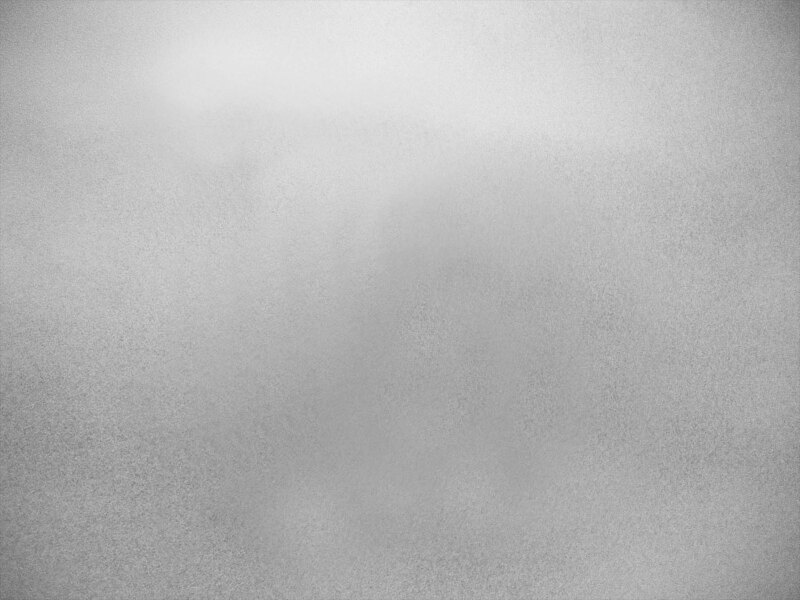 He moves up in the company to traveling agent, contracting agent and chief engineer of the company. 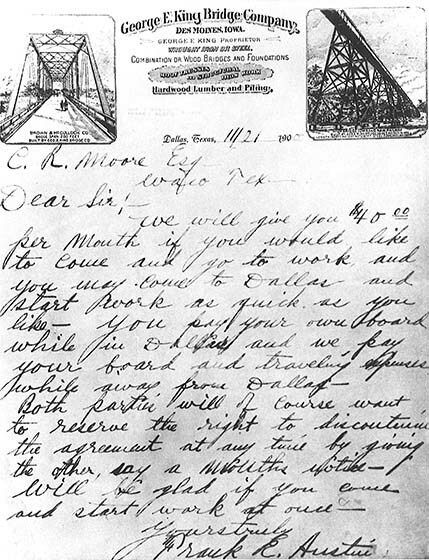 Letter written from Frank Austin to Charles Moore describing employment opportunity and compensation. Charles Moore acquires the contracting part of the company as the Austin brothers decide to focus on bridge fabrication. 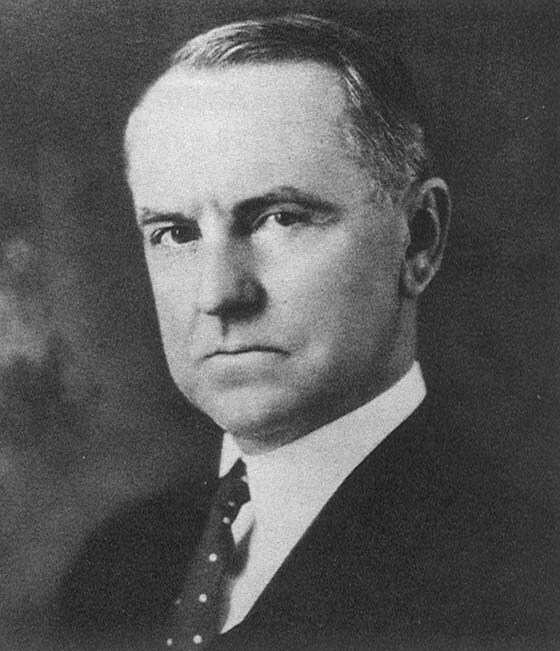 He founded the company as Austin Bridge Co. 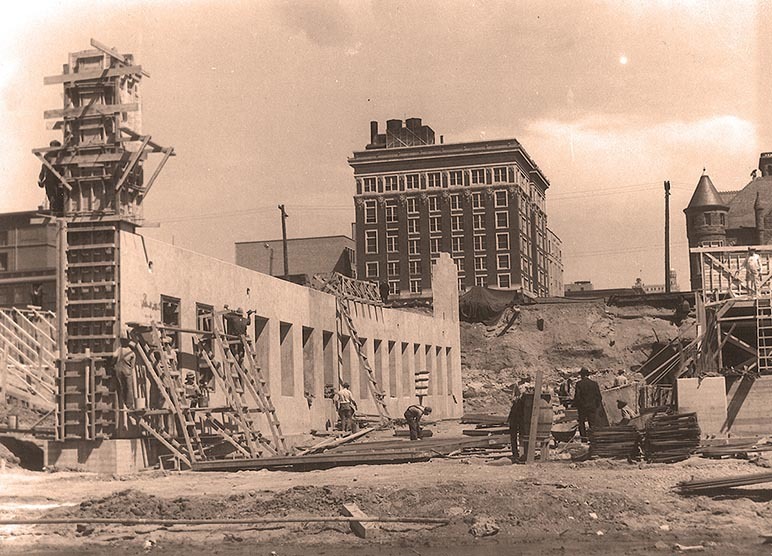 Even though World War I was underway, Austin Industries prospered and Moore took 50 contracts that year, which kept the erection crews busy. 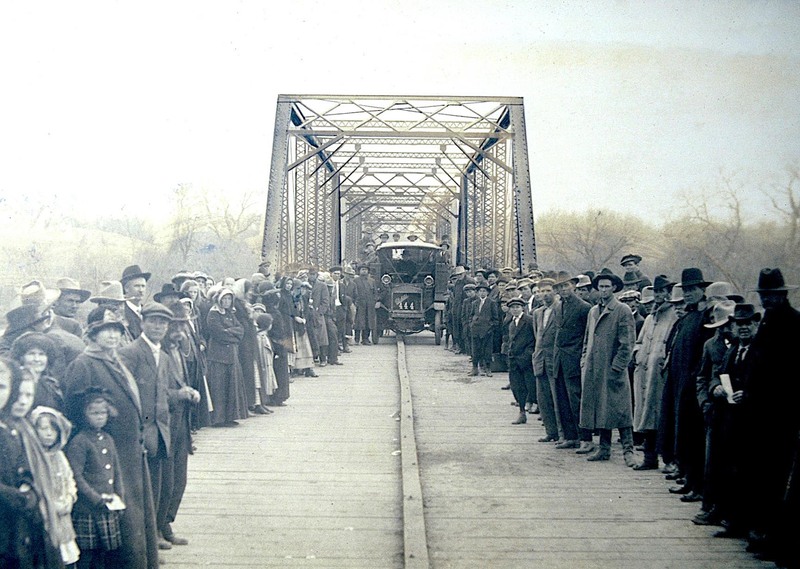 The company’s first contract was for a timber and pile trestle toll bridge across the Red River in West Texas near Electra. 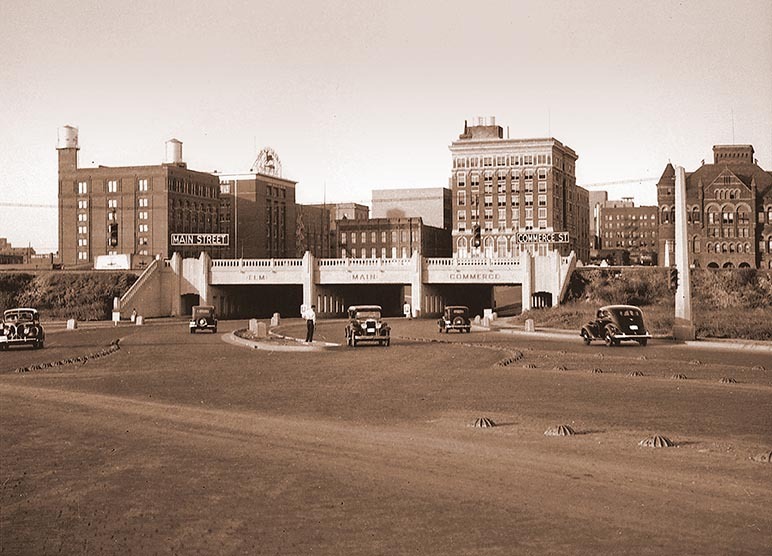 As automobiles became a common fixture on the road, Austin’s work was needed to make better roadways and bridges. By the end of the 1920s, the company had landed 1,449 contracts and the home office had grown from a one-room office to a two-story brick building in South Dallas. With little work as the Great Depression settles into Texas, Austin asks its employees to take a month’s vacation without pay in 1931. That next year, foremen were doubling up on jobs and workers left to find work at gas stations or ice delivery routes. 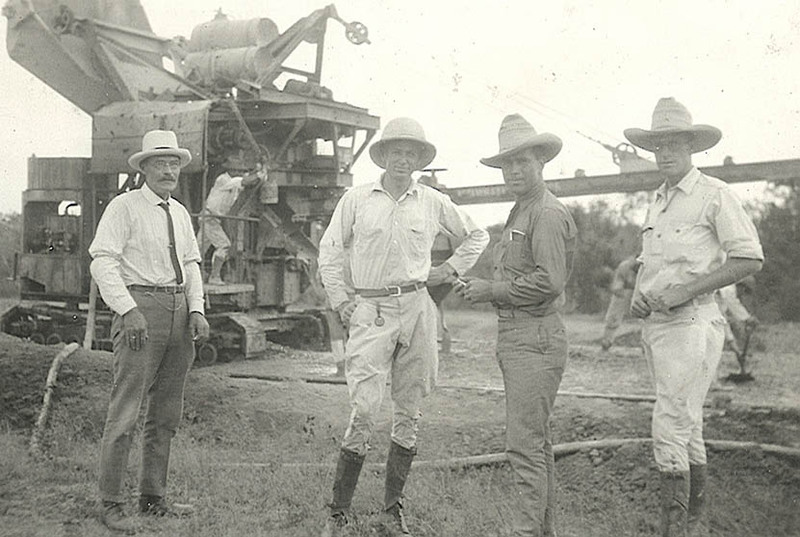 The East Texas oil fields were discovered by the end of 1930, and the company began to see work pick up. 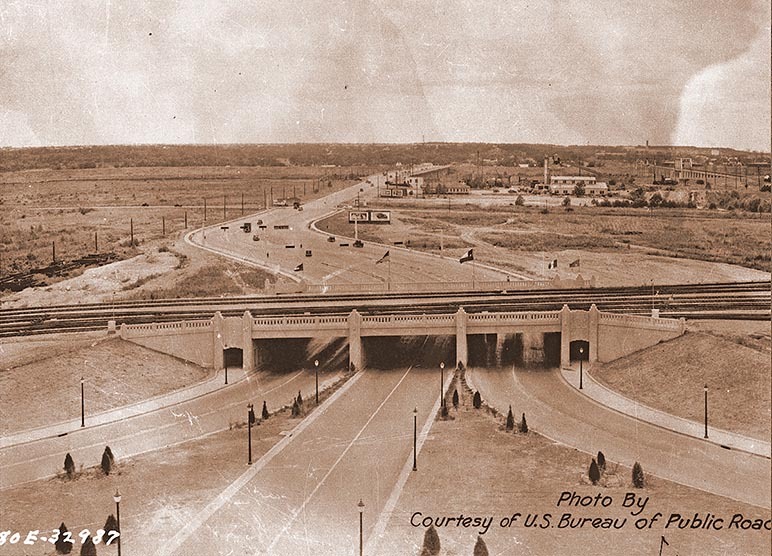 Austin Road was formed in 1932 to install asphalt paving. Austin lands a contract to build the Commerce Street Triple Underpass in downtown Dallas. 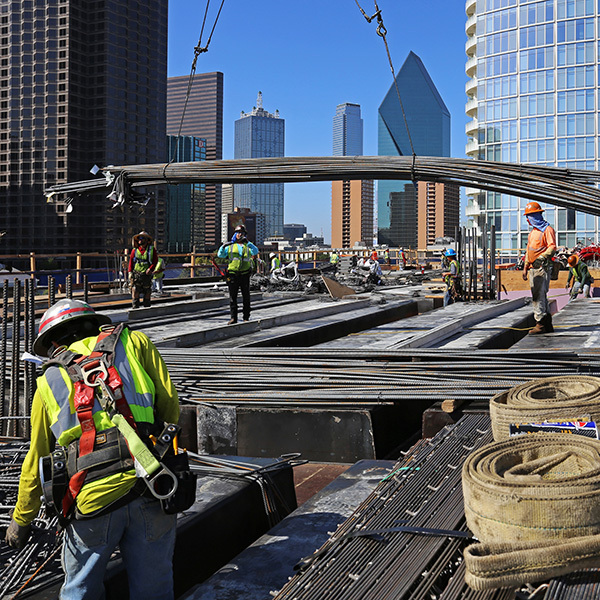 The company was hired after it completed a number of viaducts across the Trinity River. 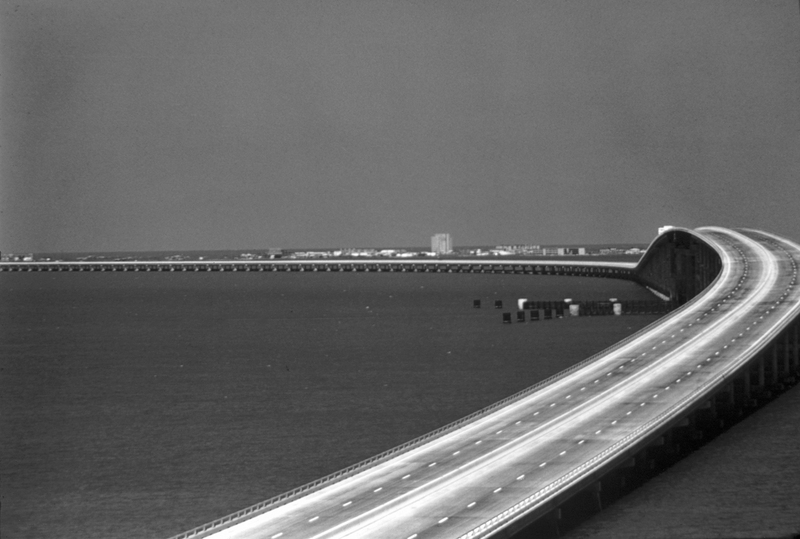 The company lands its biggest contract to date — to build the Galveston Causeway. 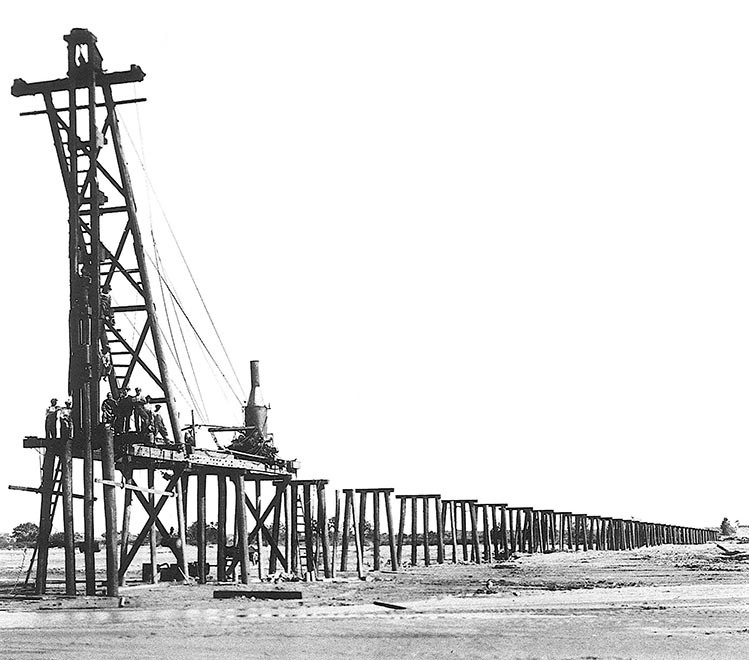 The total length of the bridge was 8,194 feet, and it marked the only free roadway access point to Galveston Island. 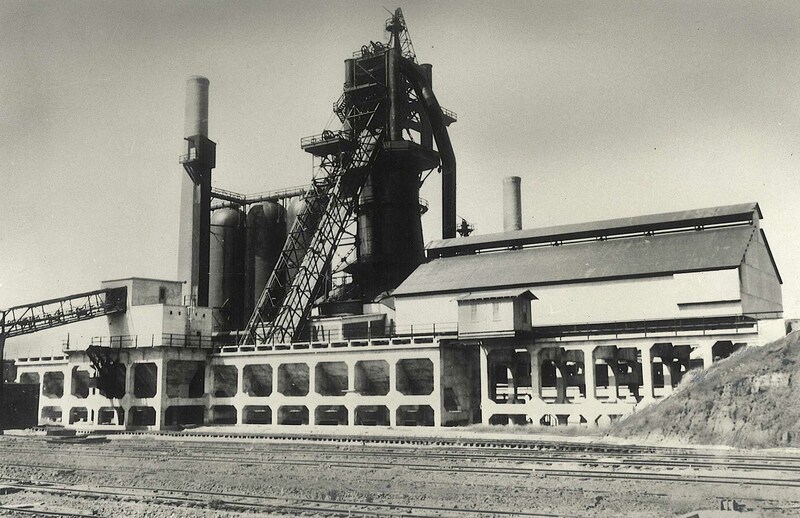 The Lone Star Steel pig iron plant was built in Daingerfield, Texas, for the government.  It was the largest job ever taken at that time and helped establish Austin as a heavy industrial contractor. 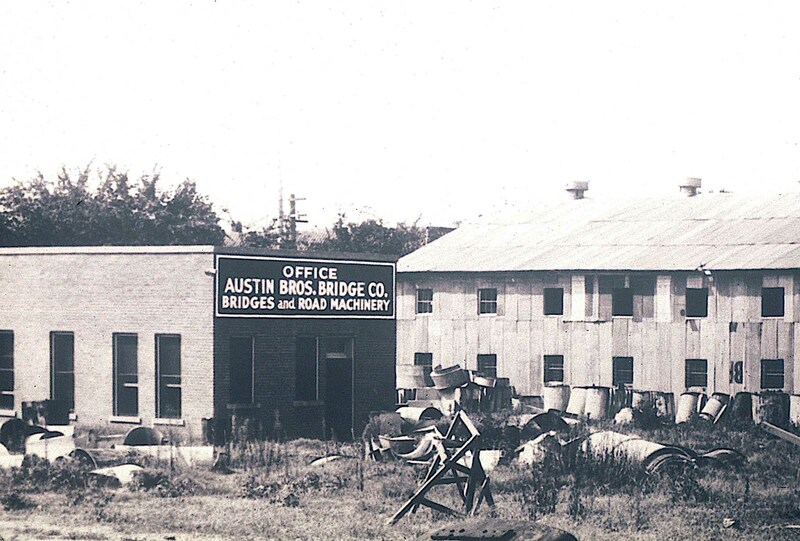 In 1941 when the country entered WWII, Austin Bridge began taking military contracts that involved everything from a variety of paving, runway work and bridge construction work. In 1943, the company received a contract with the Division of Chemical Warfare Service for the manufacture of magnesium bomb bodies to be used by the U.S. Army Air Forces in raids over Germany. 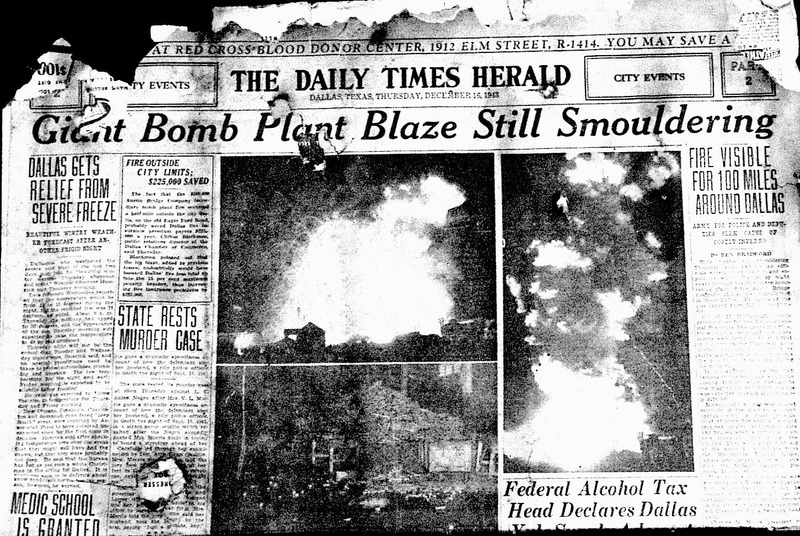 In 1943, a fire broke out at the bomb-making facility in West Dallas that was so bright the glow could be seen by pilots almost to Houston. No one was hurt, and production resumed less than a month later. At the end in 1945, the company had manufactured almost 30 million bomb bodies. Austin Bridge, Austin Road and Servis Equipment were presented with the Army Navy “E” award for excellence in defense work during WWII. 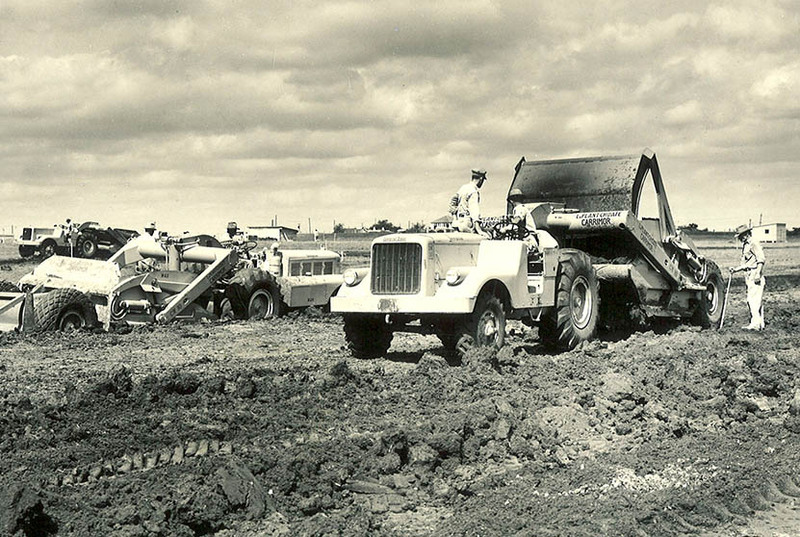 The company switches gears and transitions from the war effort to helping build the interstate highway system. Austin’s founder Charles Moore passes away. The company elects M.B. 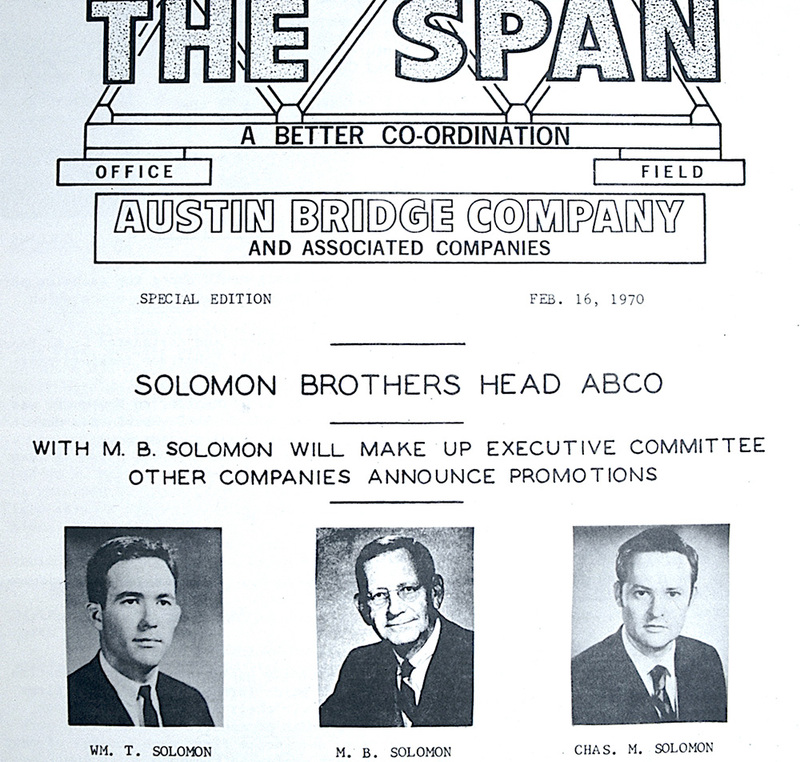 Solomon as chairman of the board for Austin Bridge Co. and its associated companies. Solomon was Moore’s son-in-law. 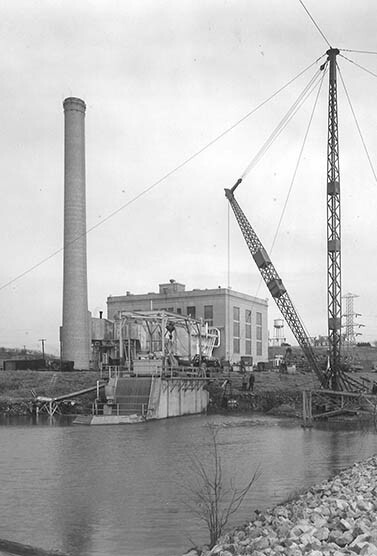 The company grew and diversified its business into power plants and coastal construction, and Austin Products was established as the manufacturing arm of the company. 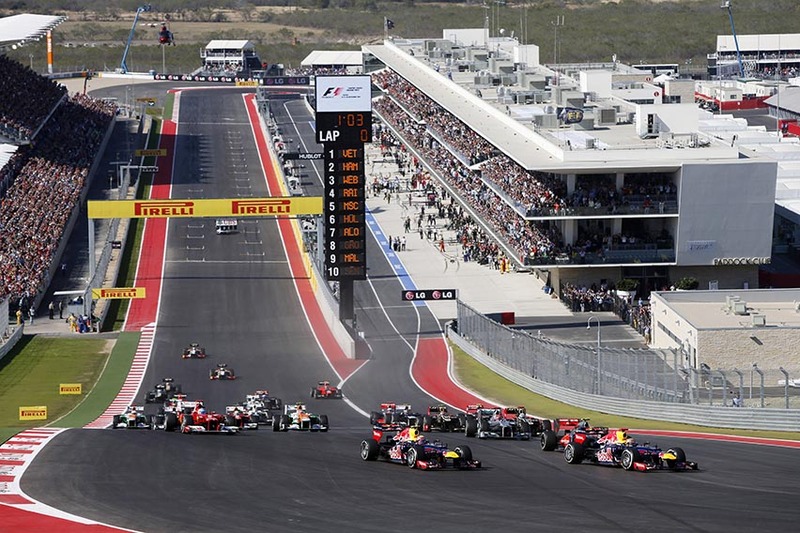 Also significant in this decade was the formation of Austin Commercial. 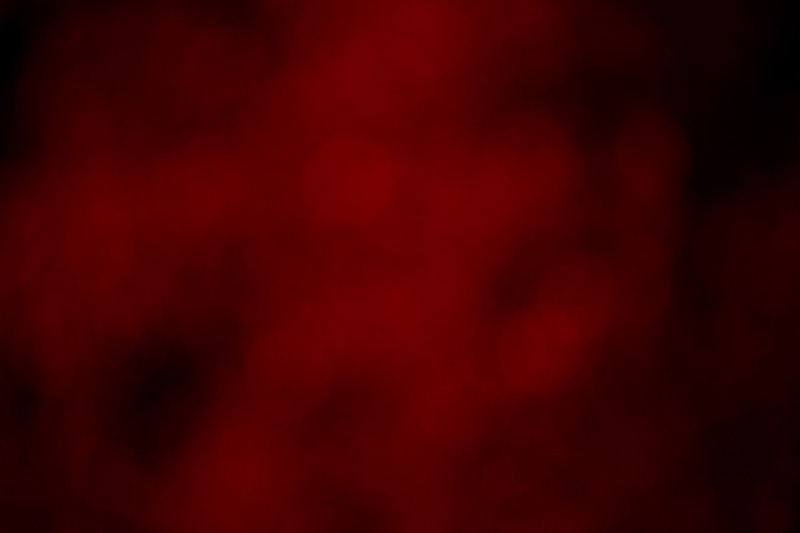 Solomon’s two sons — Bill and Charles — become leaders in the organization. 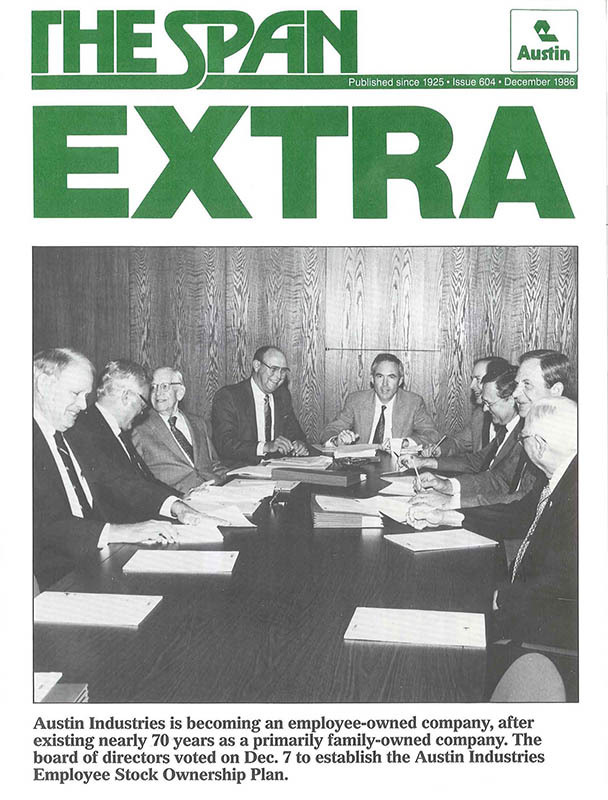 Austin founder Charles Moore steadily groomed his grandsons Bill and Charles M. Solomon for future leadership roles in the company, and in 1970 at age 27, Bill Solomon became the youngest president in Austin history. 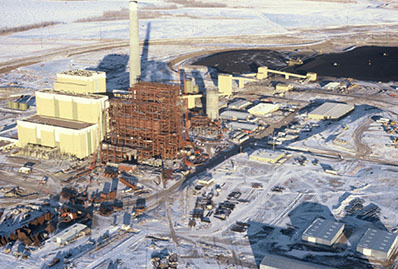 The brothers joined Austin in 1958, and each had worked in nearly all the departments of the company since their youth. 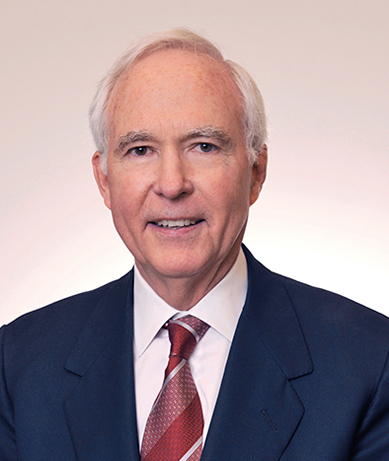 Bill was made vice president of Austin Bridge Company in 1968 and Austin president in 1970, serving as the chief executive officer for 31 years and continuing to serve as chairman until 2008. Charles Solomon served as the chief legal officer and as the vice-chairman until March 2005. 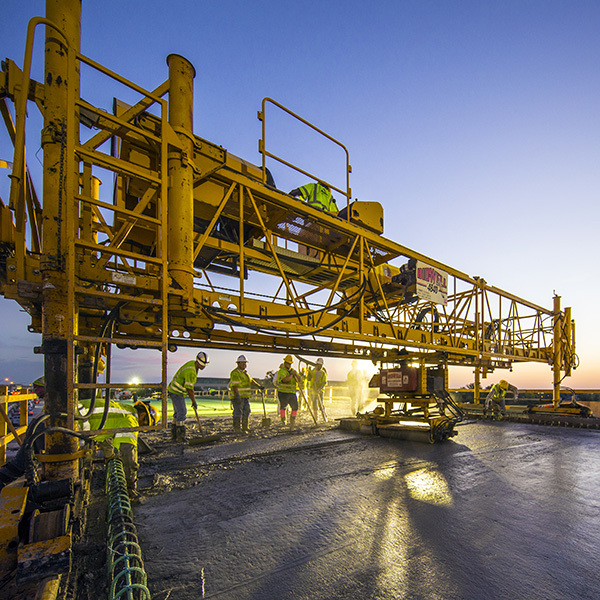 Austin Bridge completes the spine roadway at the new Dallas/Fort Worth International Airport. 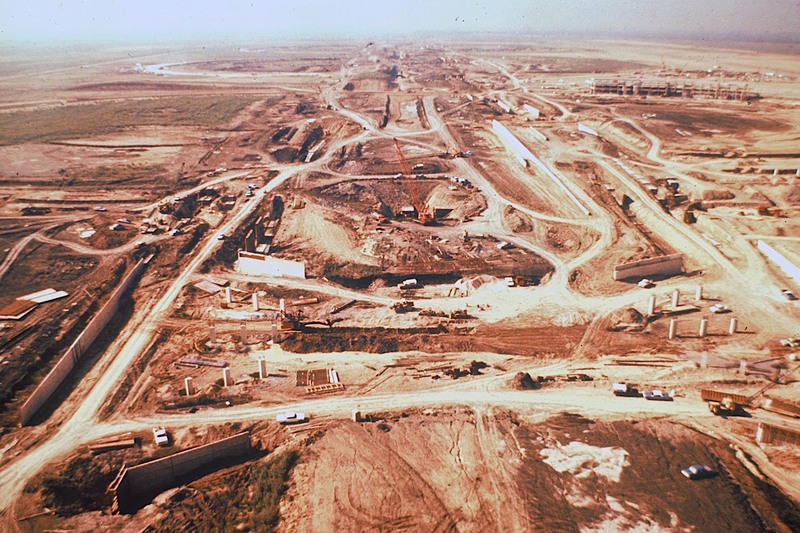 The job was about 1.5 miles long, and consisted of the roads and bridges that run the full length of the airport, truly making them a “Spine Roadway.” The interchange construction consisted of 36 bridges, 40,000 cubic yards of walls and 400,000 square yards of paving. 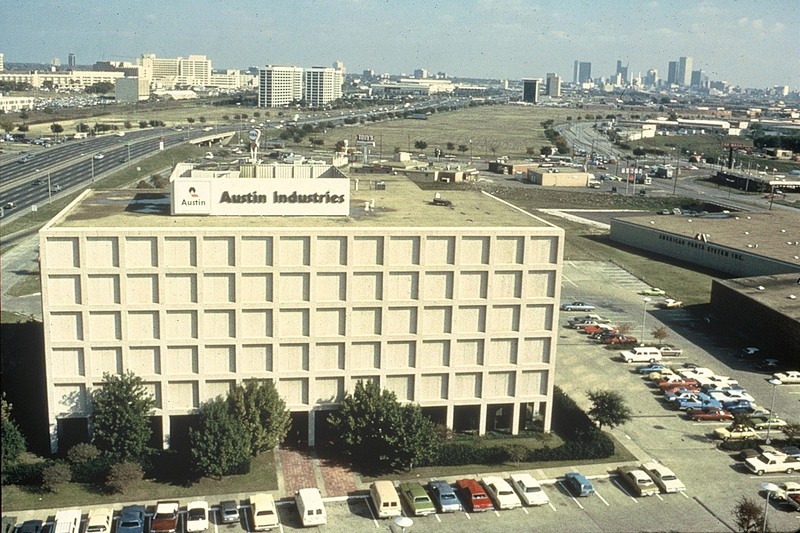 Austin was reorganized and the parent company, Austin Industries, was formed. 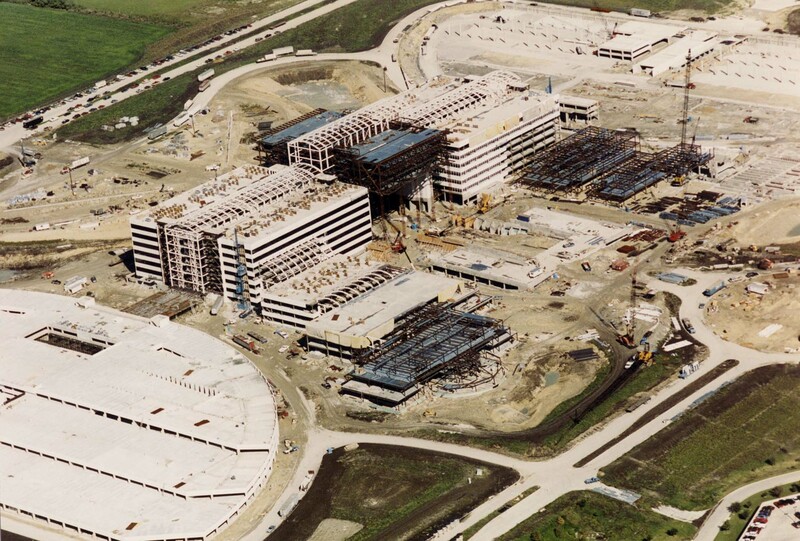 By the next year, Austin launched a commercial construction division called Austin Commercial. 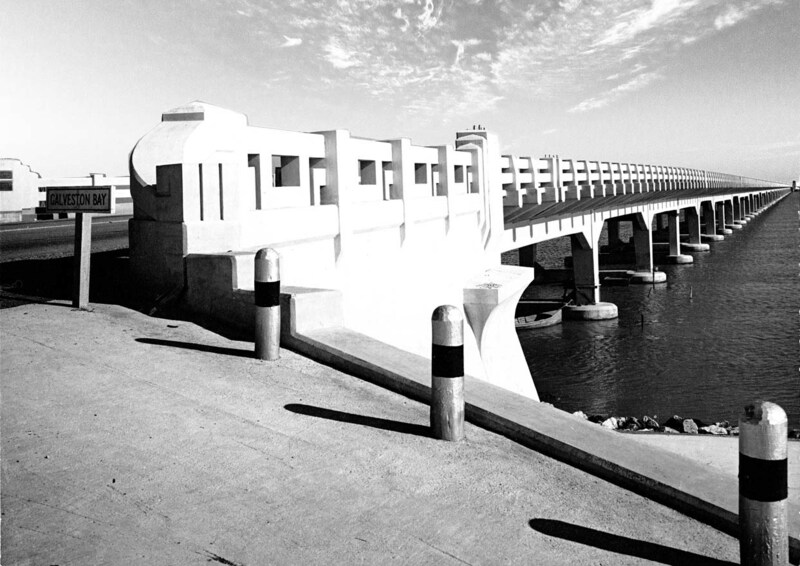 The Queen Isabella Memorial Causeway was completed by the Austin Bridge Company (Now Austin Bridge & Road) in South Texas. The road passes the Port Isabel Lighthouse then curves and arches over the Intracoastal Waterway to reach South Padre Island. 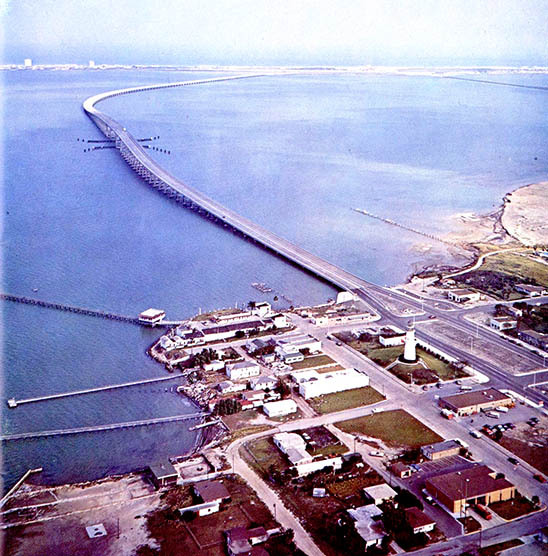 The two-and-a-half mile causeway was the longest single bridge ever built by the Texas Highway Department (now TxDOT) when it was finished. 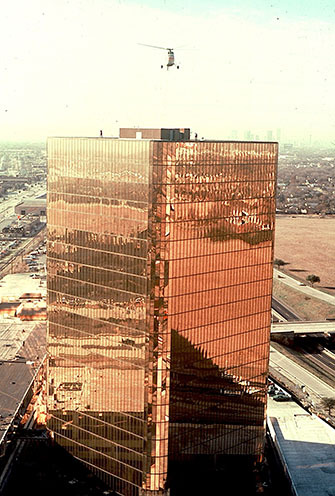 In 1975, Austin Commercial was contracted to build the second gold 20-story high-rise at the Campbell Centre in Dallas. 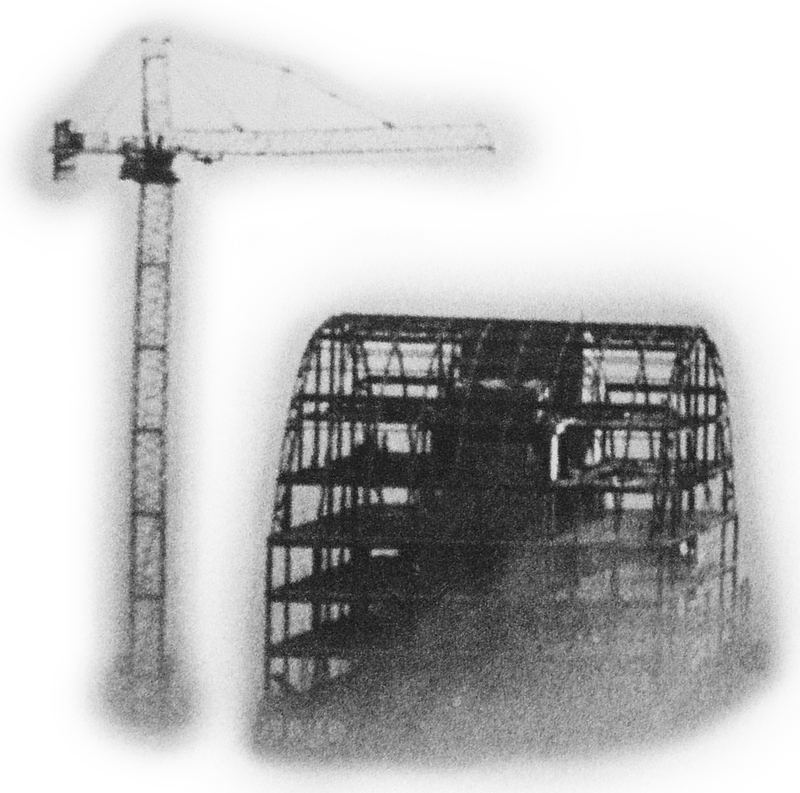 The building was completed in 12 months, versus 18 months it had previously taken a competitor to build its twin with union labor. 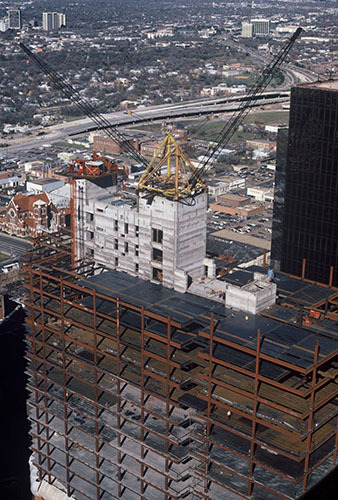 The project is significant because it ushered in the merit shop movement in Dallas, and it established Austin as a first-class commercial builder and market leader into the 1980s and beyond. 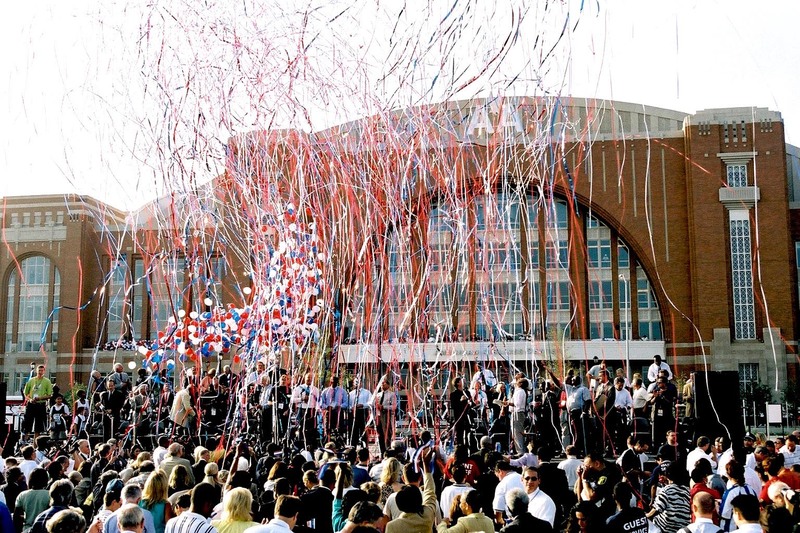 American Airlines relocates its corporate headquarters from New York City to Fort Worth, Texas. 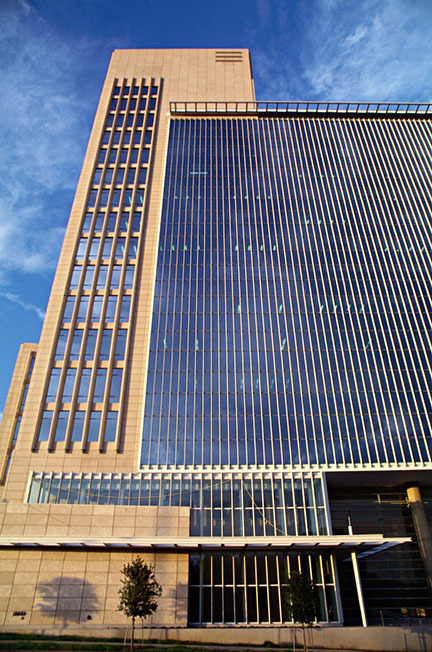 This served as Austin Commercial’s first landmark corporate office/campus. 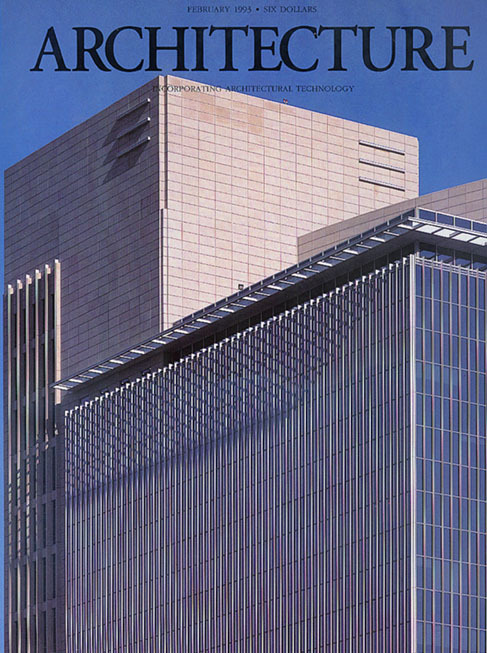 Austin is later selected to build American Airlines Centreport IV in 1986 and Centreport V in 1988. 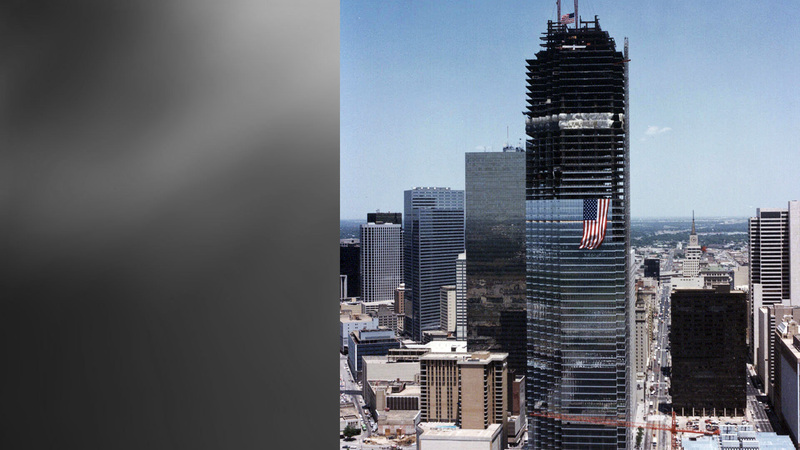 The Tower is 483 feet high and is 26 stories, making it the 9th tallest building in Dallas at its time of completion. 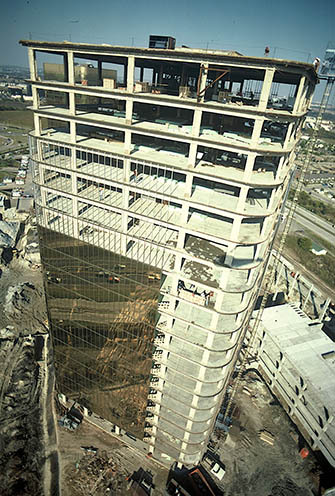 This project was the forerunner in the area for using a slip form concrete core with structural steel perimeter framing. 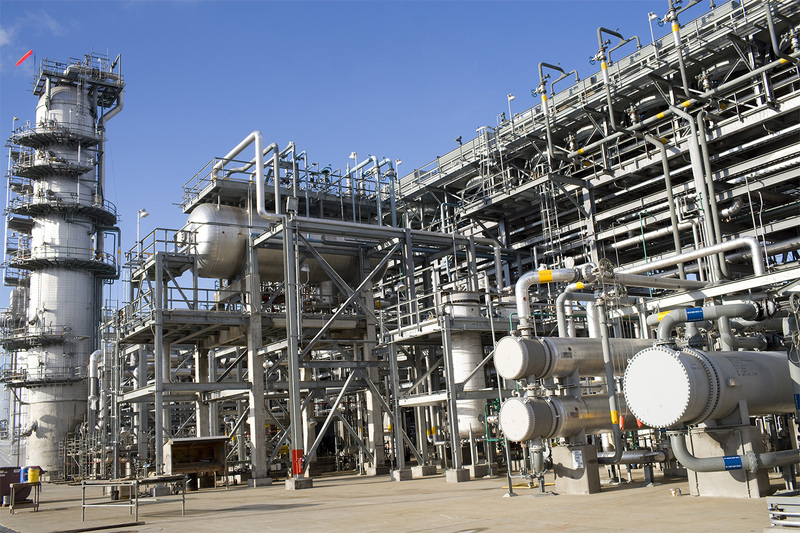 Austin Industrial was formed to meet the growing maintenance and construction needs of the petro-chemical, power and manufacturing industries. The business was built along the Texas Gulf Coast, expanding from Houston to the Beaumont-Port Arthur area. The company capitalized on open shop labor in a highly unionized field. 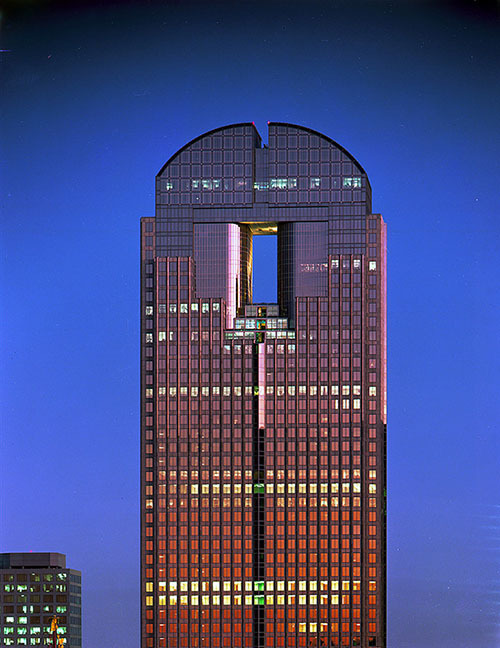 Upon completion in 1985, the Bank of America Tower instantly achieved a landmark status as the tallest building in Dallas and the most recognizable silhouette of the downtown skyline. The skyscraper is clad in silver reflective glass. At night, the skyscraper is outlined by more than two miles of radiant emerald green argon that is seen for miles. 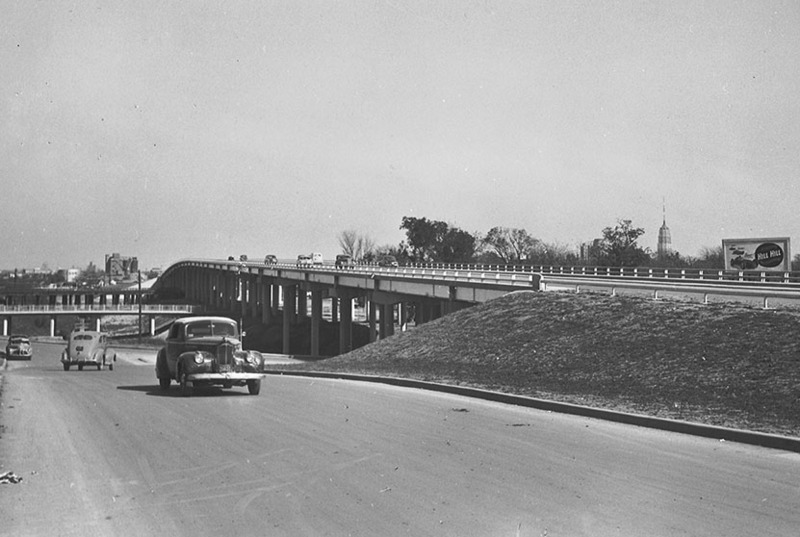 The first precast, post-tension segmental bridge in Texas was the downtown "Y" at the intersection of IH 35 and IH 10 in San Antonio. 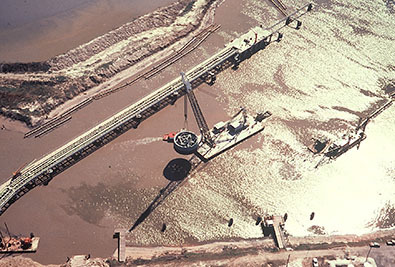 Built by Austin Bridge & Road, the project began in 1985 and included 45-ton bridge segments that were made at a casting yard and delivered to the site. In 1987, Austin was awarded its third segmental bridge project in San Antonio. 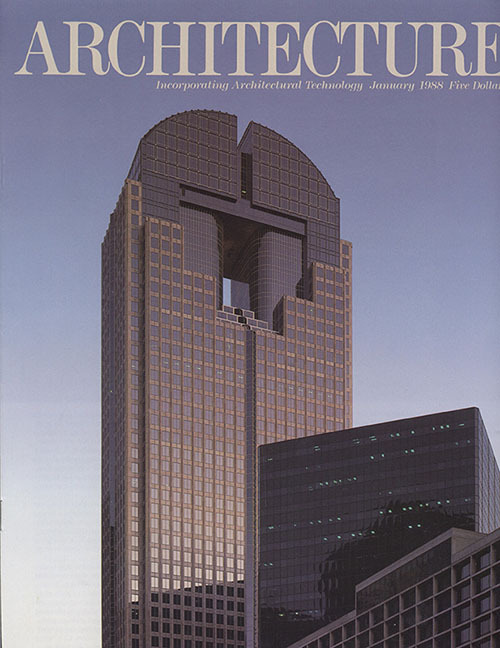 The 55-story JPMorgan Chase Tower in Downtown Dallas was completed in 1987 for repeat customer Trammell Crow. The building has unusual angles and curves with hardly any square cuts, including one obviously large opening. 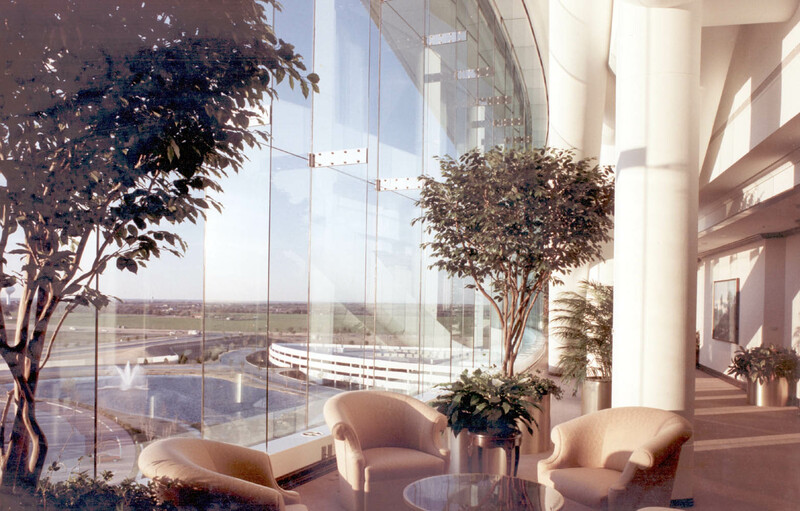 Sky Window soars 75 feet from the 44th through the 49th floor and is 27 feet wide. Austin Road and Austin Paving merged in the late 8os, keeping the name Austin Paving. 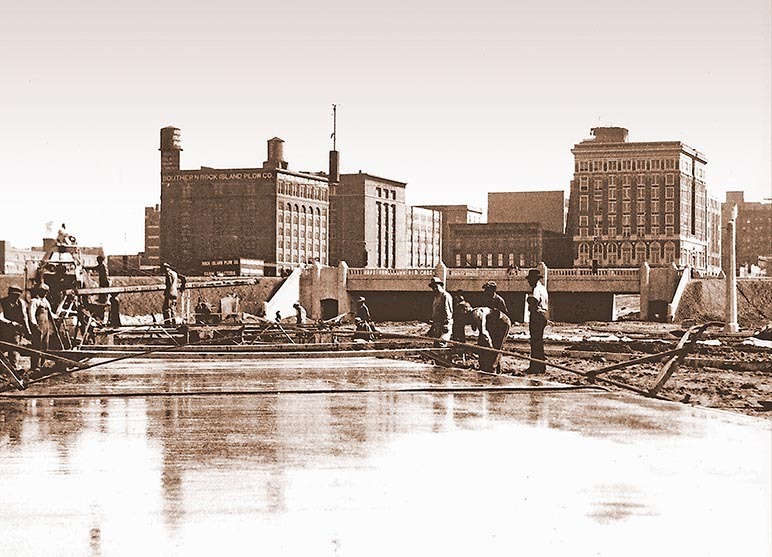 Austin Paving and Austin Bridge then merged in the early 90s to form Austin Bridge & Road. 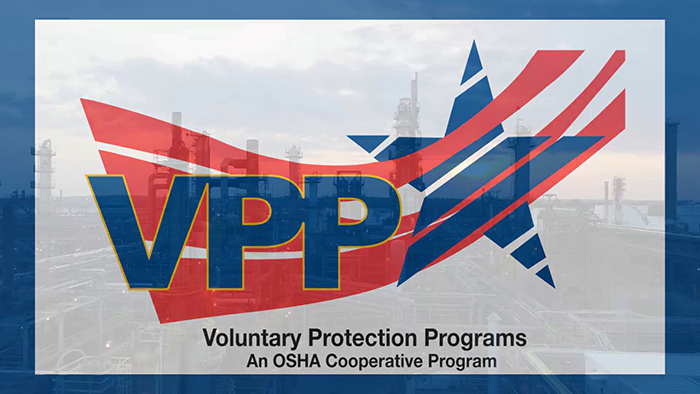 Austin Industrial became the first merit shop contractor accepted into the OSHA VPP Program. The industry needed a training program to improve the skill level and knowledge of craft professionals, and Austin Industrial initiated validated craft assessments and helped develop the NCCER training curriculum. 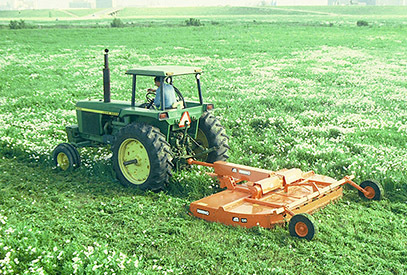 The standardized craft training helped employee-owners increase job skills and advance their careers. 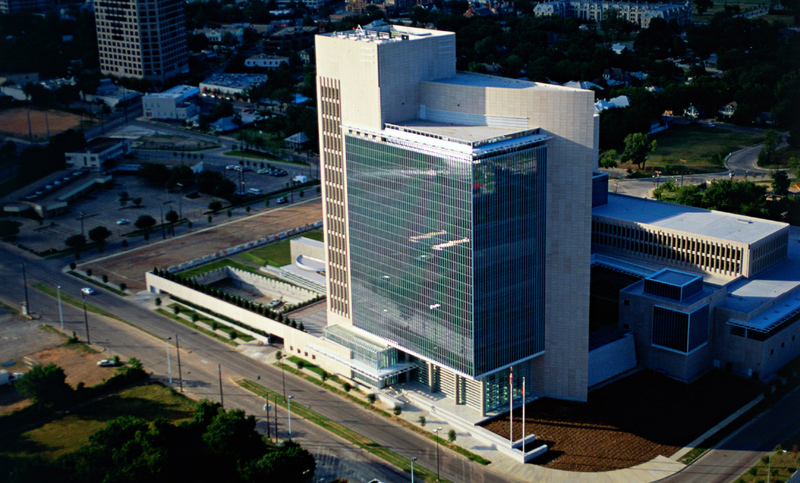 Austin Commercial completes the Federal Reserve Bank of Dallas, the only Federal Reserve Bank in the state of Texas. 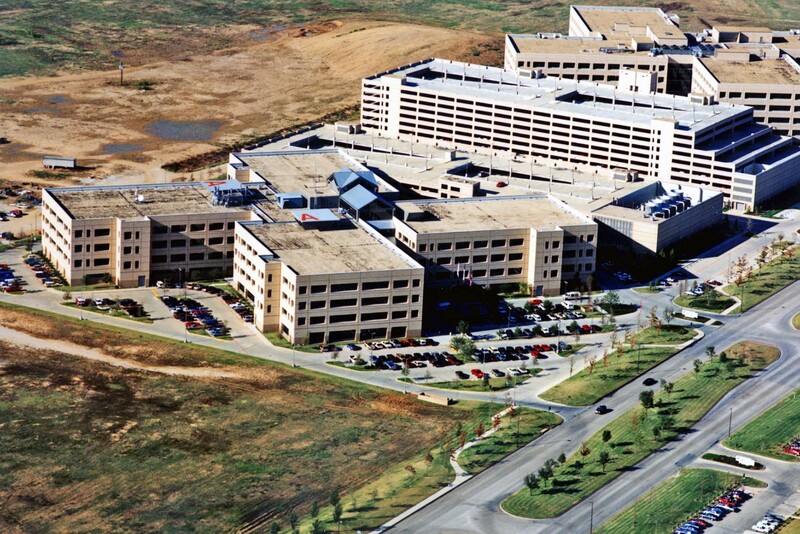 Austin Commercial completes the largest corporate campus in DFW at the time of completion, EDS Corporate Headquarters. 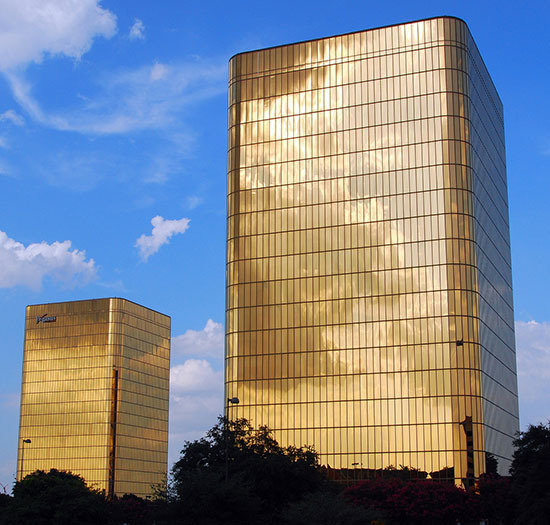 It would remain such until 2015 when State Farm relocated to Richardson, Texas, another Austin Commercial project. 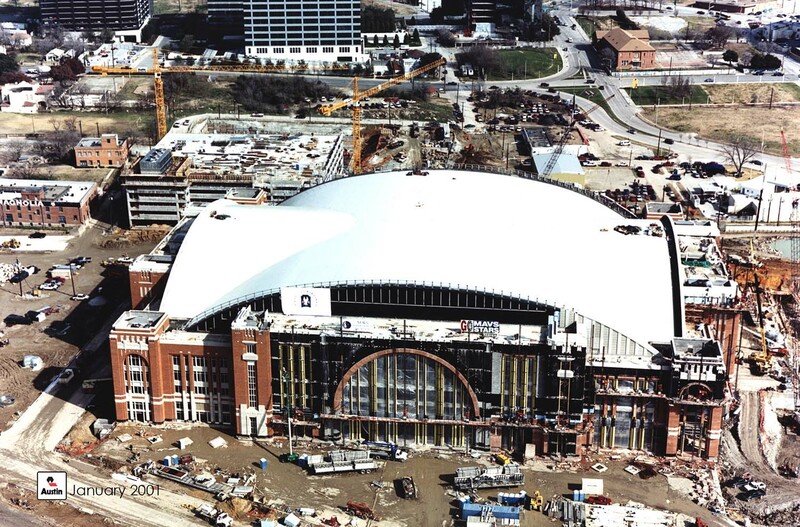 Austin Commercial completes the American Airlines Center in Dallas. 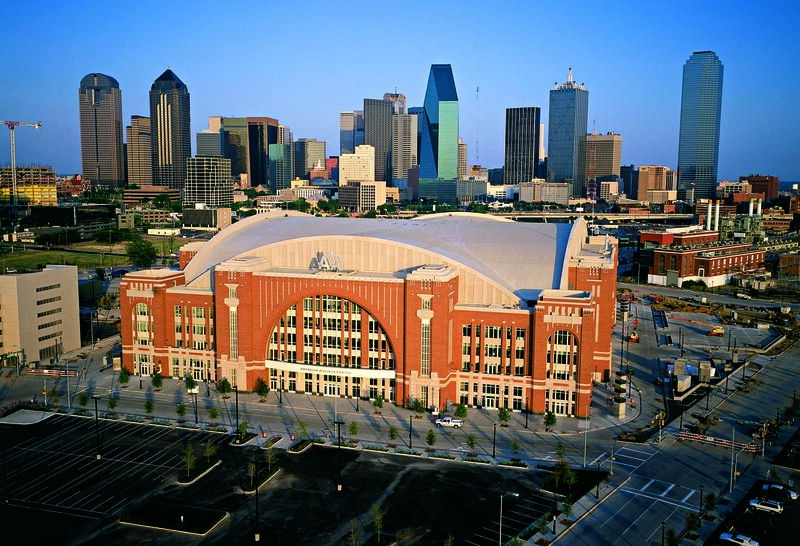 The multipurpose arena is the home of the NBA’s Dallas Mavericks and the NHL’s Dallas Stars Hockey Club, and it accommodates concerts and other events. The company builds Terminal D at Dallas/Fort Worth International Airport, which totals 2 million square feet with 28 gates. 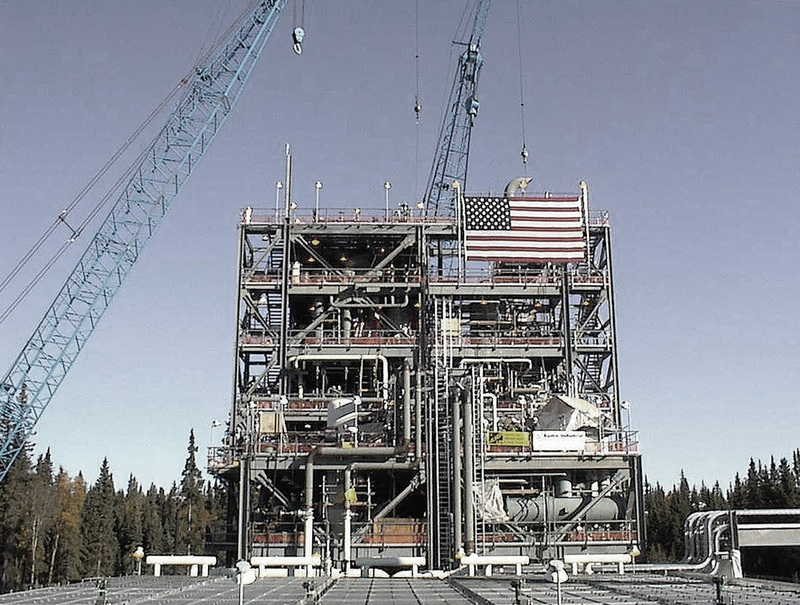 Austin Industrial completed a gas-to-liquids plant for BP Exploration in Nikiski Alaska. It tested the process of converting natural gas into liquid crude—a cutting-edge process that had never been tested on a large-scale basis. 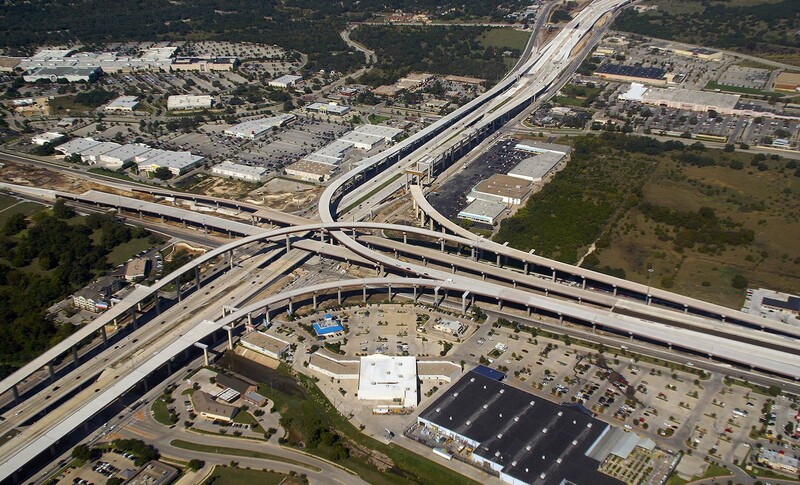 Constructing the intricate, five-level interchange over traffic required precise execution of the construction processes as well as complete coordination with subcontractors and local utility companies. 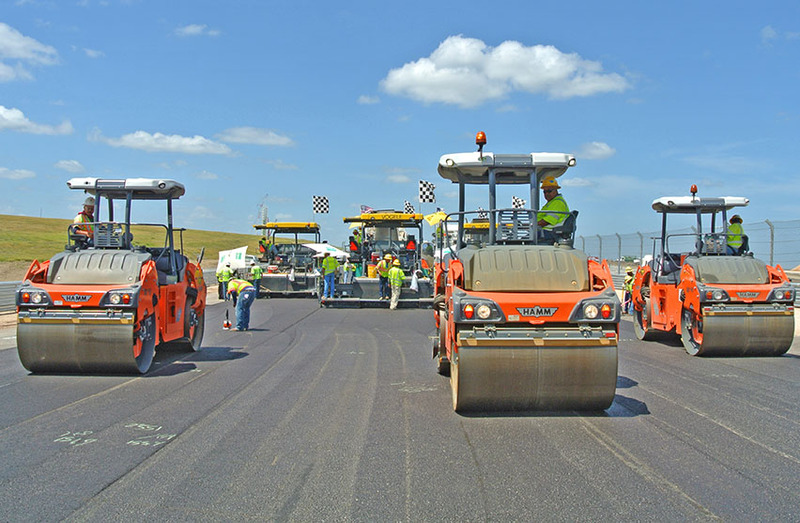 Faced with an early completion date set by TxDOT, the Austin team worked diligently to meet their goal. 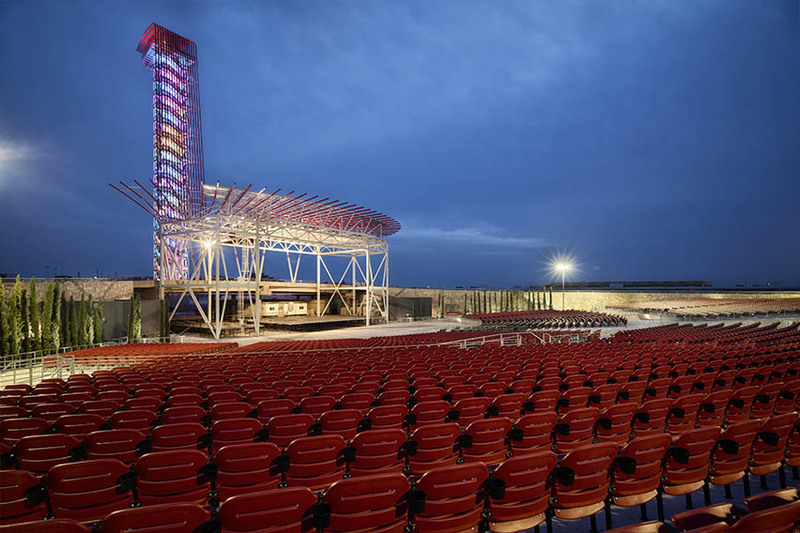 The project won the 2008 AGC Aon Build America Award. 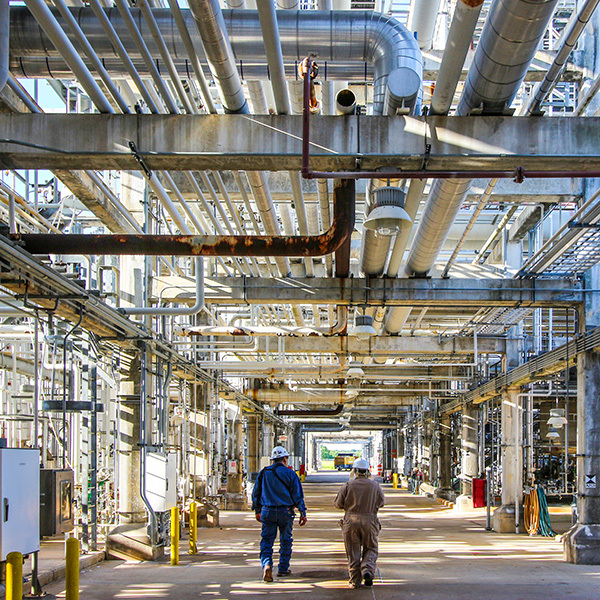 Austin Industrial was awarded a major construction contract to perform a portion of Motiva’s multi-billion dollar crude expansion project in Port Arthur, TX. 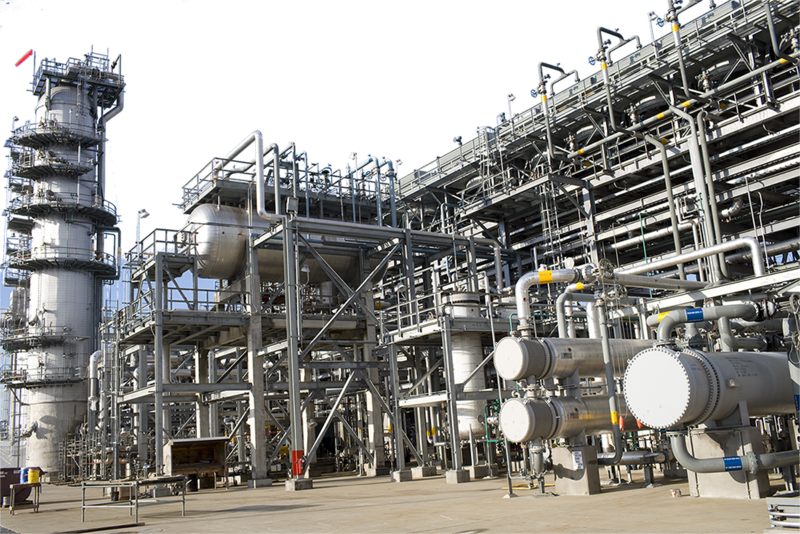 This project almost doubled the crude oil production at the plant, making Motiva the largest refinery in the United States. 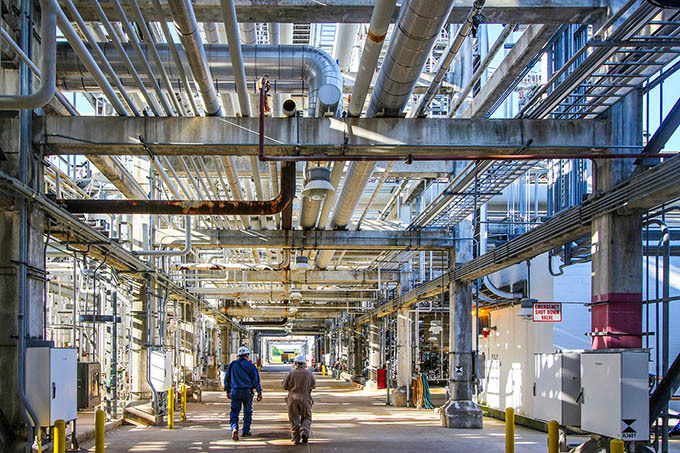 Austin’s small capital group at LyondellBasell was accepted by OSHA’s VPP Mobile Workforce Demonstration Category, one of only 5 such designations in the country. Austin Industrial set a safety milestone in 2012 at the Motiva refinery, celebrating two million safe work hours without a recordable injury and 3.2 million safe work hours without a lost-time injury. 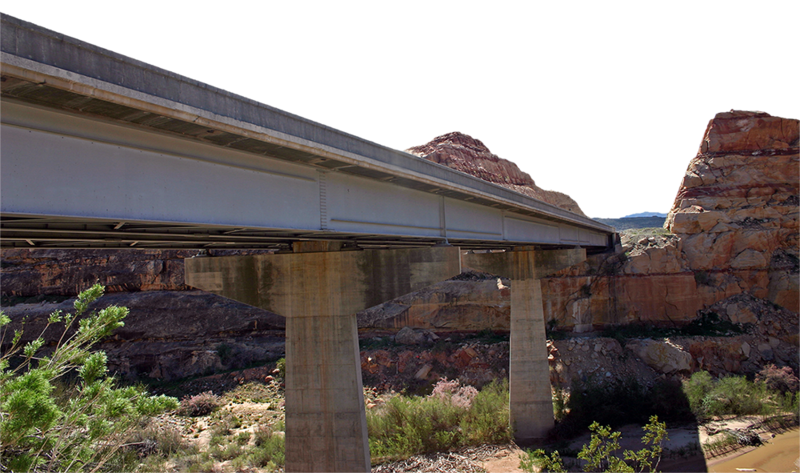 Austin Bridge & Road completes the I-15 Bridges over the Virgin River Gorge for the Arizona Dept.  of Transportation. 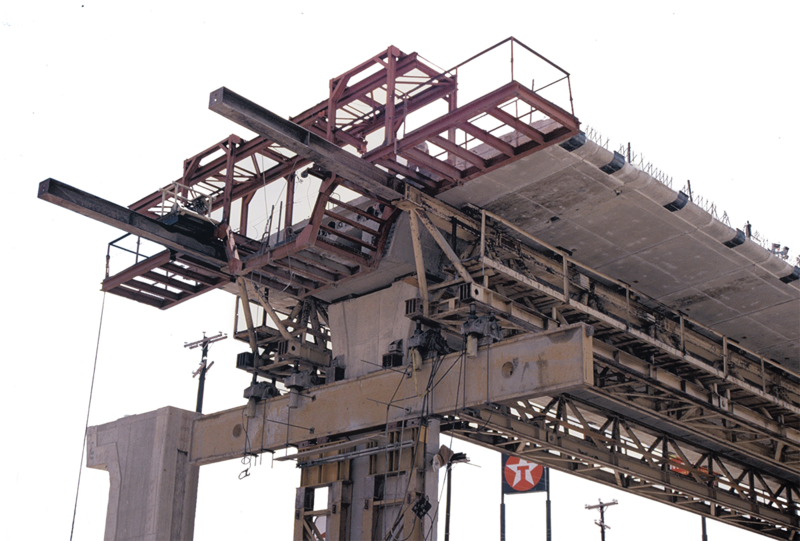 The award-winning project included the renovation and replacement of a major steel bridge structure in Northern Arizona, and it won the 2009 Marvin M. Black Partnering Excellence Award from the Associated General Contractors of America. Austin Industrial made an Increased focus on specialty services (scaffolding, insulation, painting) to include stand-alone services as well as maintenance & construction support. Entered the auto industry through a facilities maintenance services agreement with Bridgestone.  Expanded turnarounds capabilities to include major stand-alone turnarounds. Entered the pulp & paper industry through maintenance & small capital contracts with International Paper. 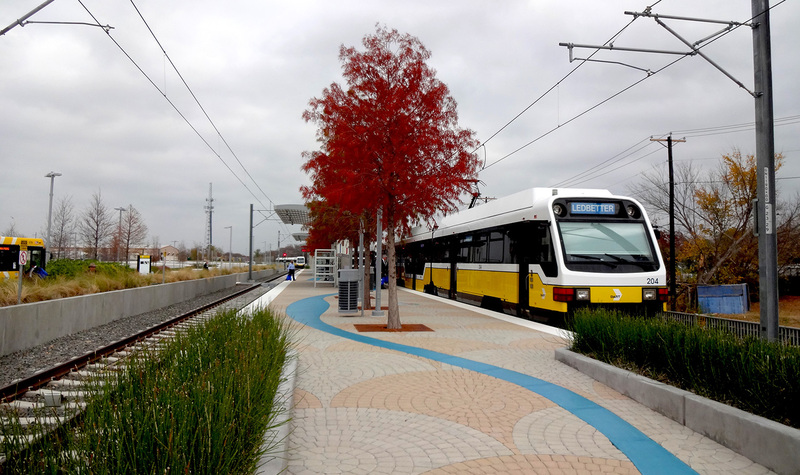 As the prime contractor, Austin constructed 4.8 miles of light rail double-track guideway running along an existing freight rail right of way. 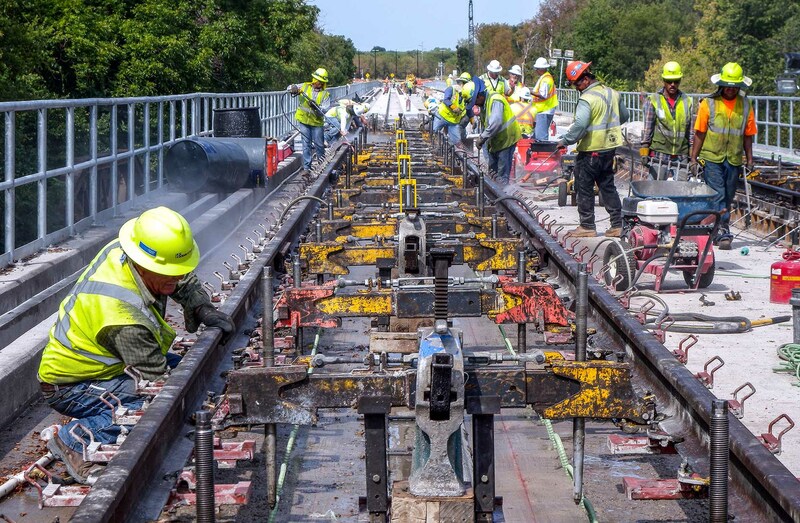 Scope of work included drainage and utility relocations and improvements, seven bridges, ballast walls, cut walls, retaining walls, and 8,300 linear feet of freight track realignment. 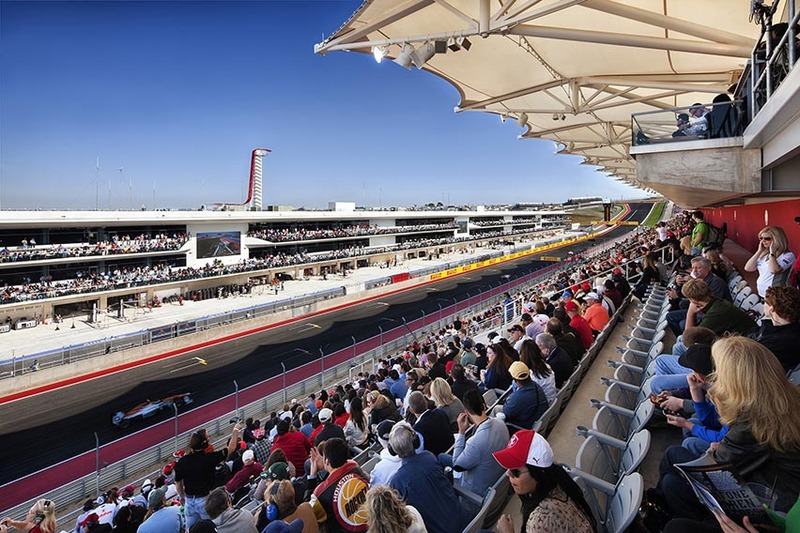 Austin Commercial and Austin Bridge & Road construct the first Formula One Grand Prix racetrack in the United States, the Circuit of the Americas Formula 1 track near Austin, TX. 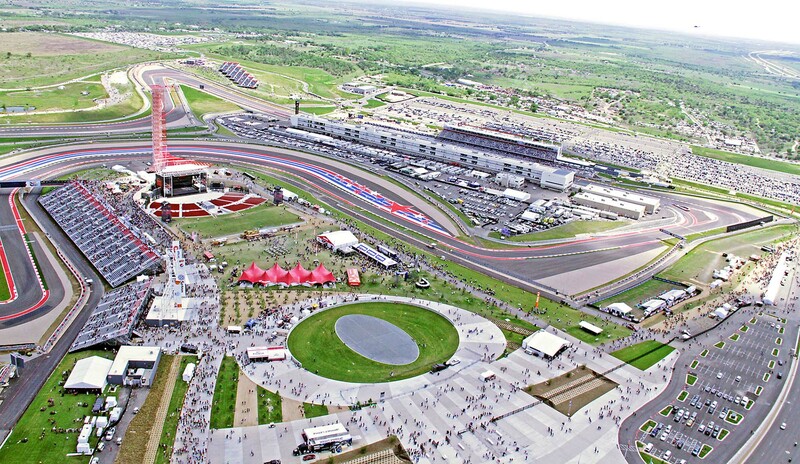 The 3.4 mile, state-of-the-art circuit track has a capacity for 120,000 fans. 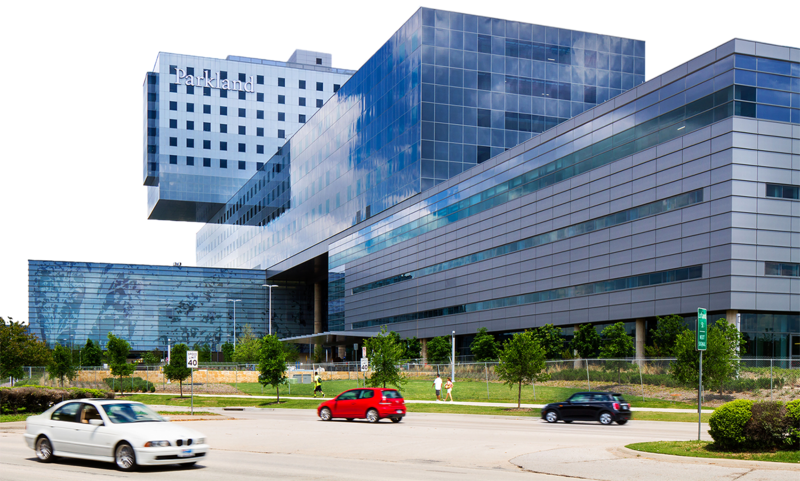 Austin Commercial finishes the initial phase of the $1.3 billion Parkland Replacement Hospital as part of a joint venture with BARA. 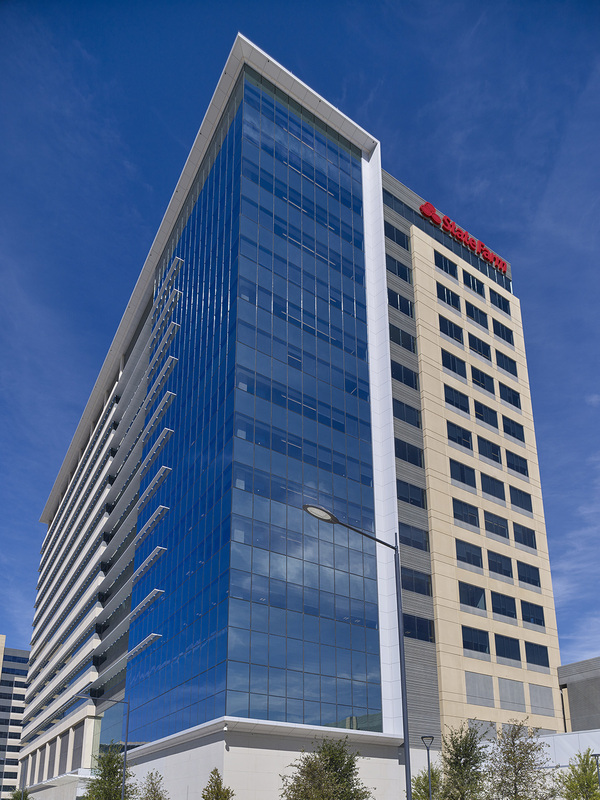 Austin Commercial finishes the last tower of State Farm Insurance’s four-tower campus at Richardson’s $1.5 billion CityLine development. Austin Industrial opened a pipe fabrication shop at its headquarters in La Porte, TX. 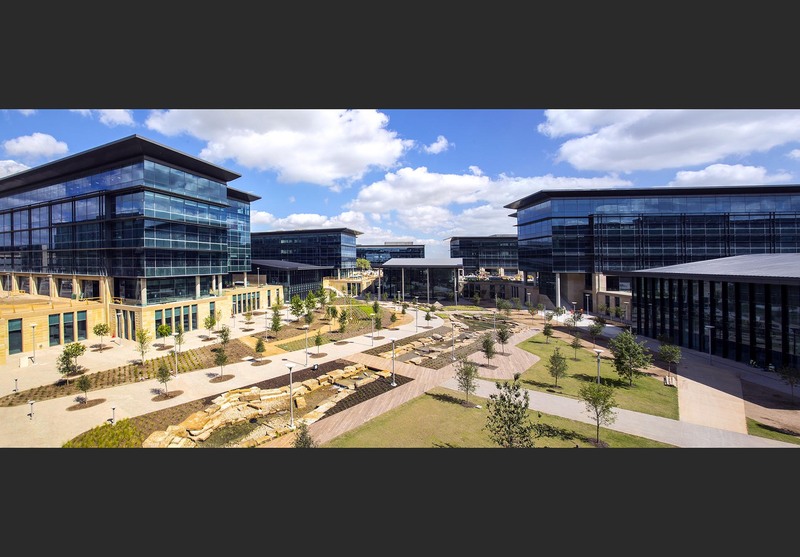 In 2017, Austin Commercial completes the largest corporate campus in North Texas, the Toyota North American Headquarters. 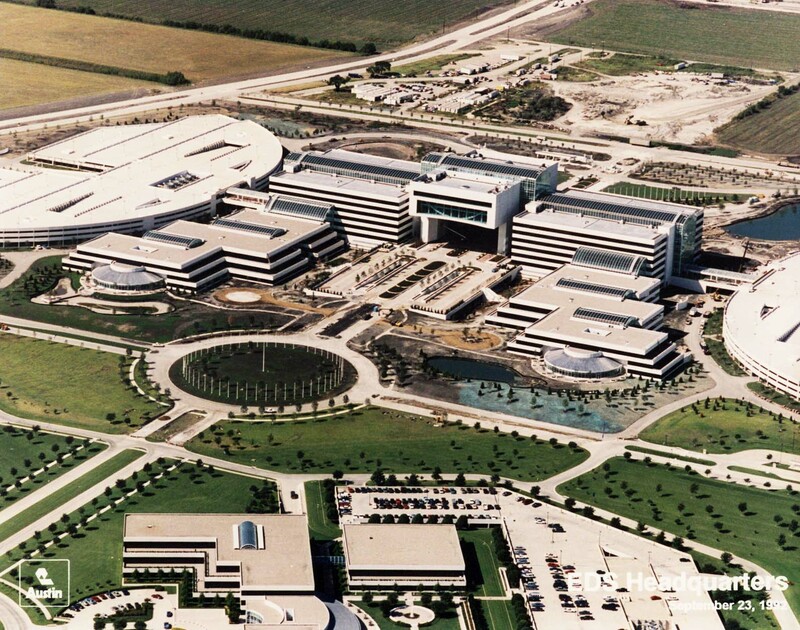 The campus has the largest corporate office on-site solar system in Texas and provides 25% of the power needed for the entire campus. 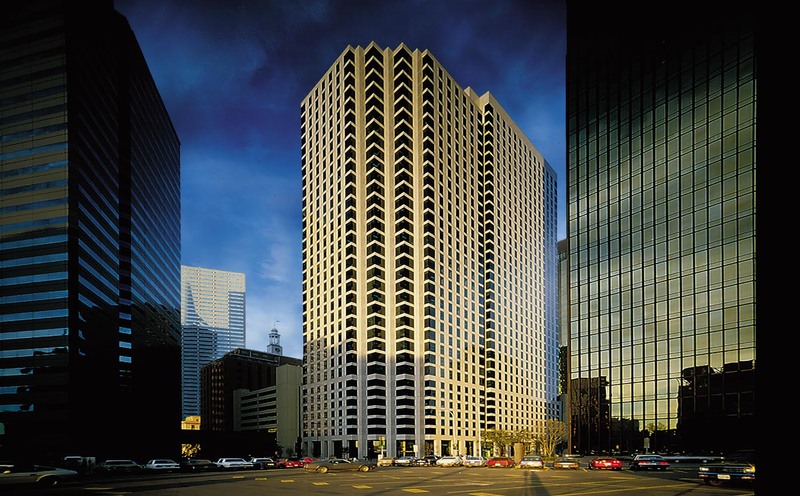 The project achieved LEED Platinum certification. 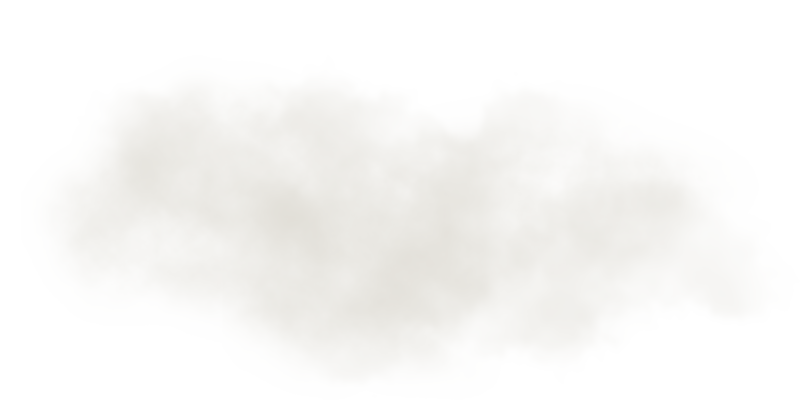 pulp and paper industries for more than 60 years. We are committed to the success and the future of our customers, our people and the communities and environments we serve.  And we look forward to the next 100 years of service and landmark projects in the construction industry.  This interactive timeline is formatted for desktop and laptop viewing only.